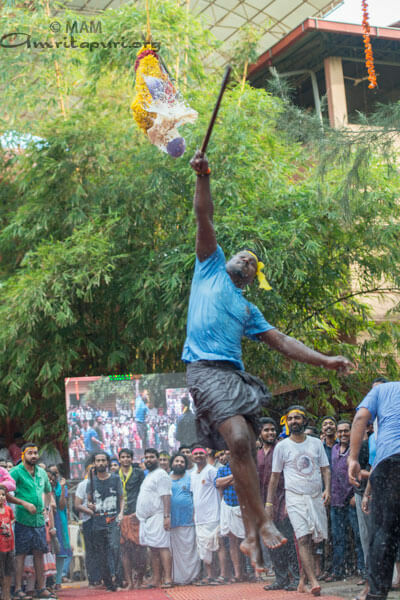 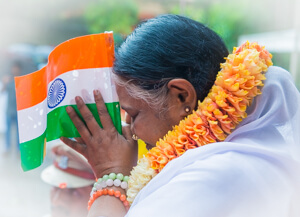 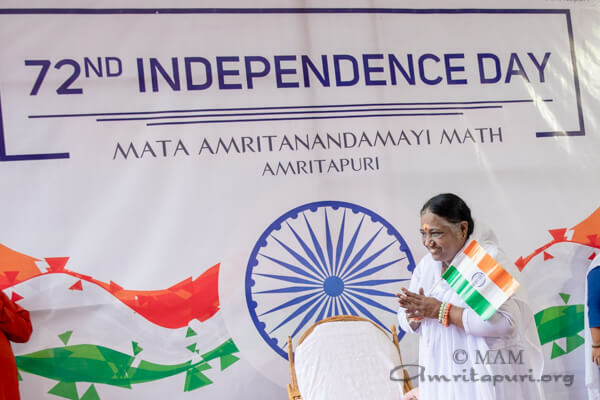 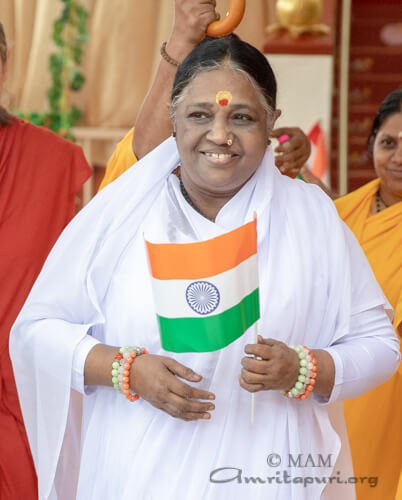 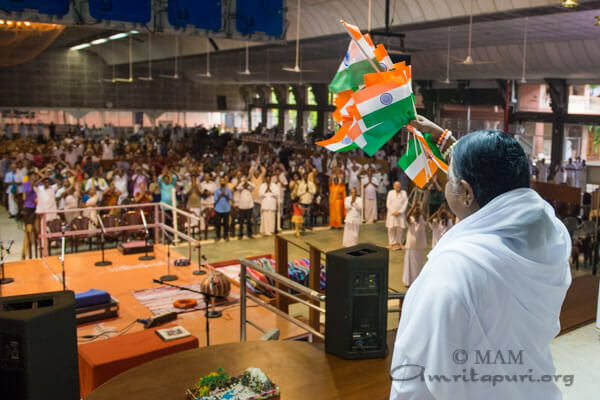 Amma hoisted the National flag, celebrating India’s 72nd Independence day at Amritapuri. 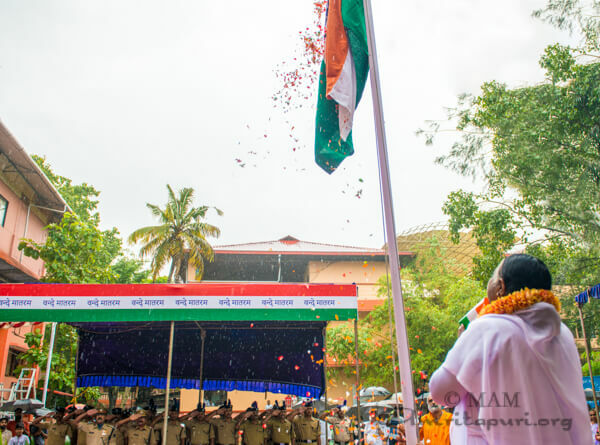 As Amma unfurled the tricolour flag, the military force did a ceremonial salute. Amma stood in the rain while saluting the flag, praying during the National Anthem. 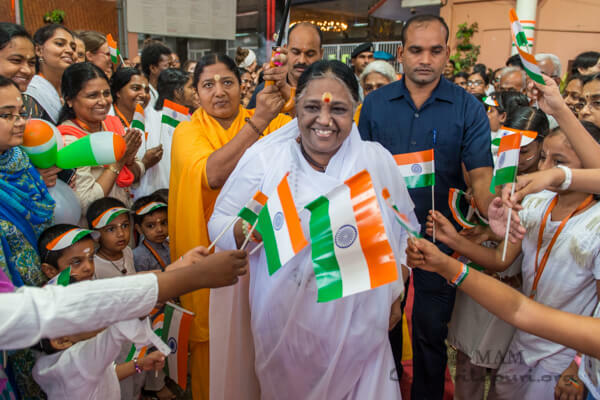 Many people and children could be seen standing with tri-colour flags and celebrating India’s Independence day with Amma. 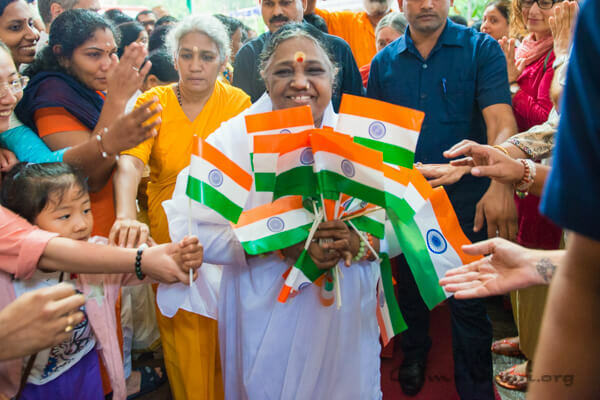 Amma also gave away sweets to the soldiers. 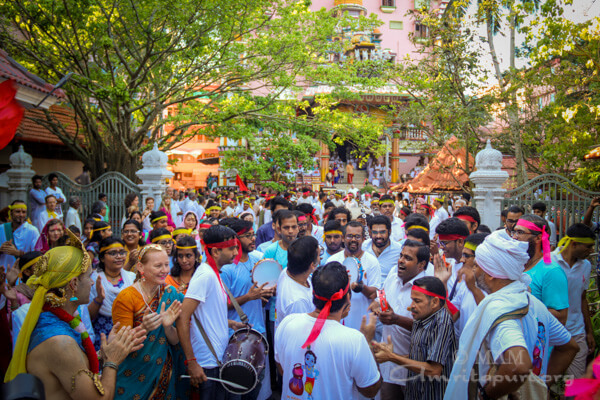 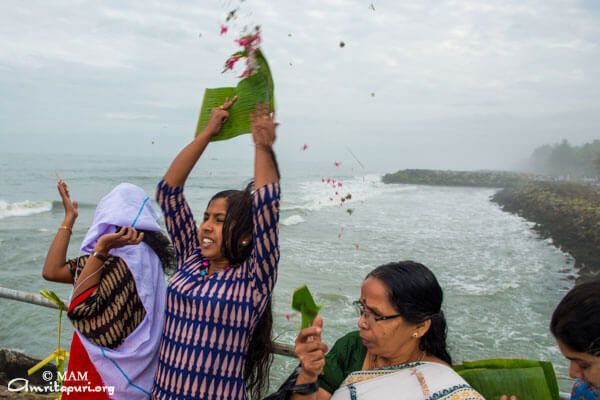 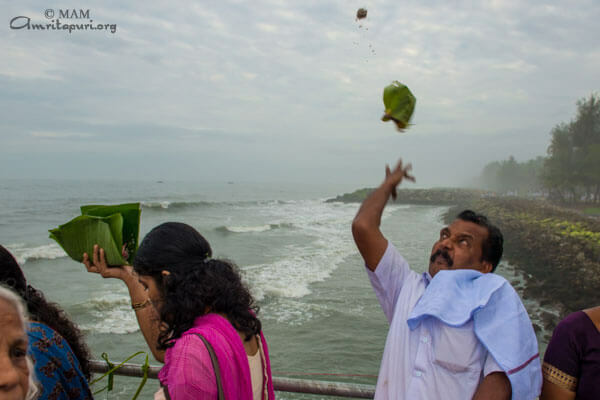 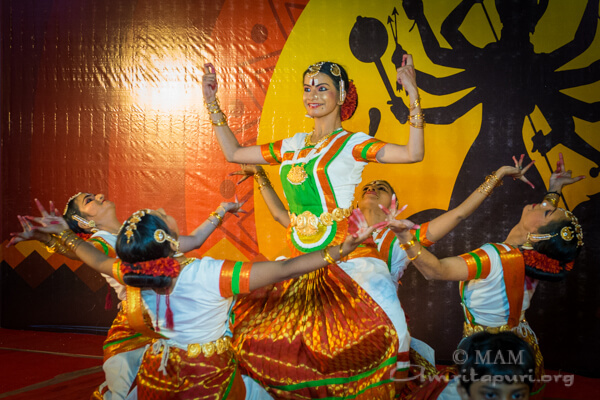 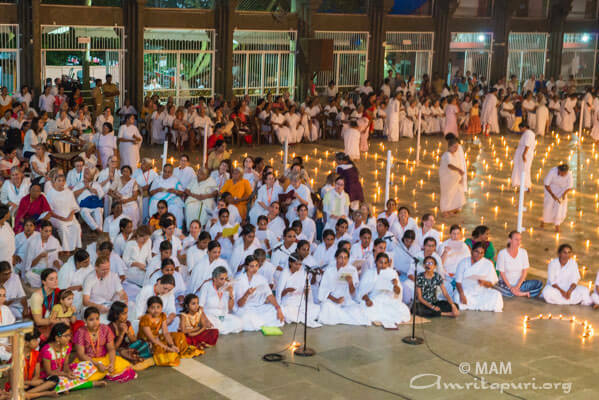 Diwali was celebrated throughout Amritapuri in many ways. 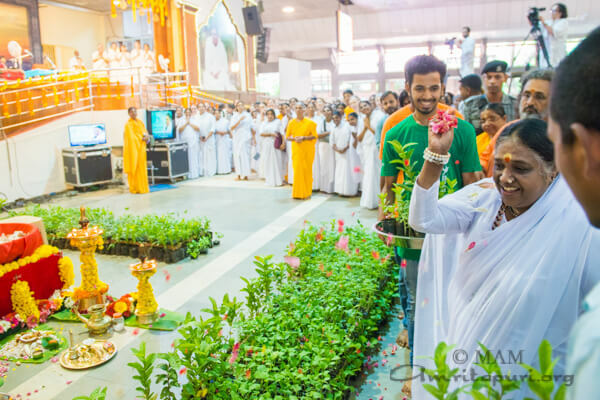 In the morning, as Amma made her way to the stage for the day’s darshan, she was welcomed by a group of Amma’s children from Tamil Nadu, dressed in beautiful attire and holding diyas (lamps) in their hands. 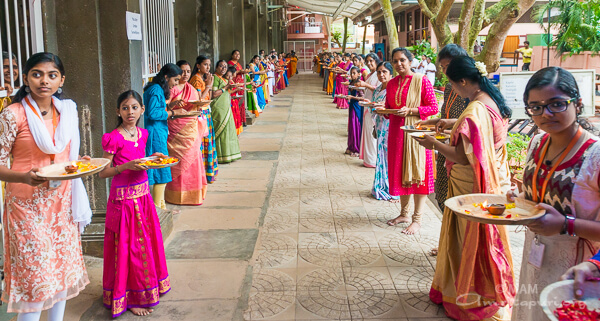 They chanted hymns of Lakshmi, the goddess of prosperity. 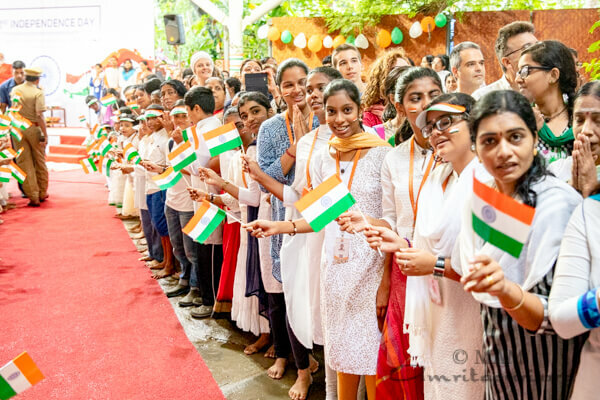 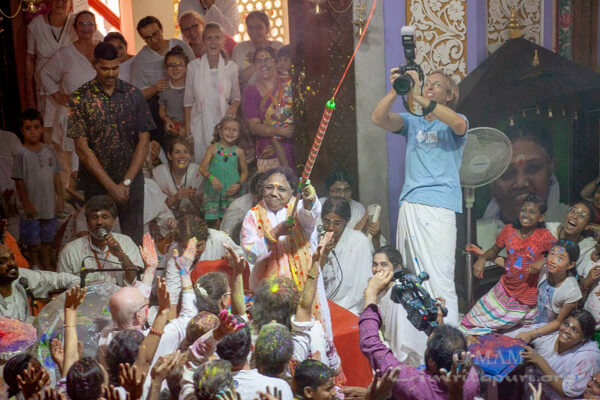 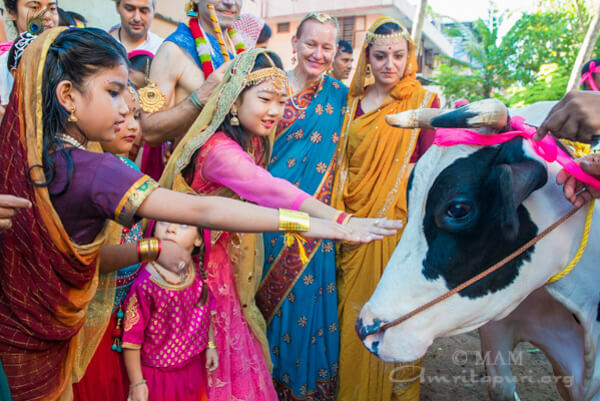 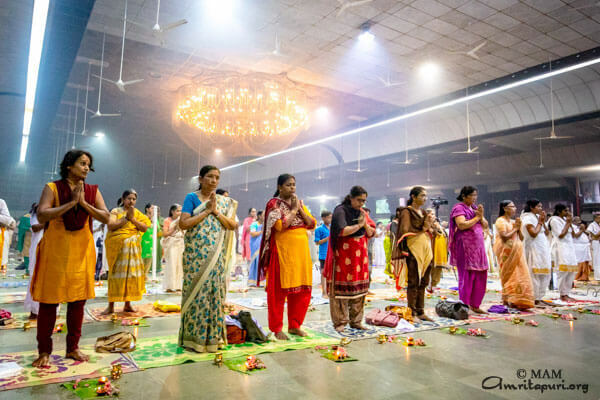 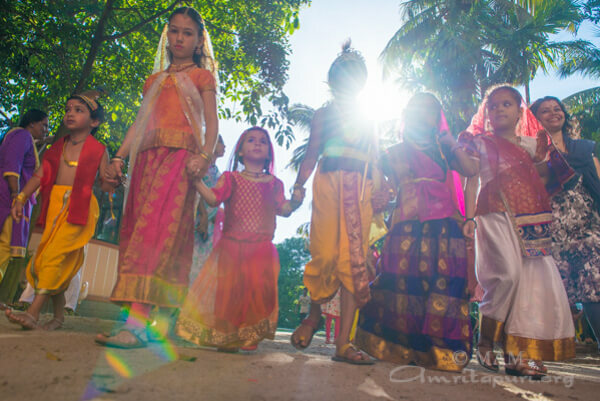 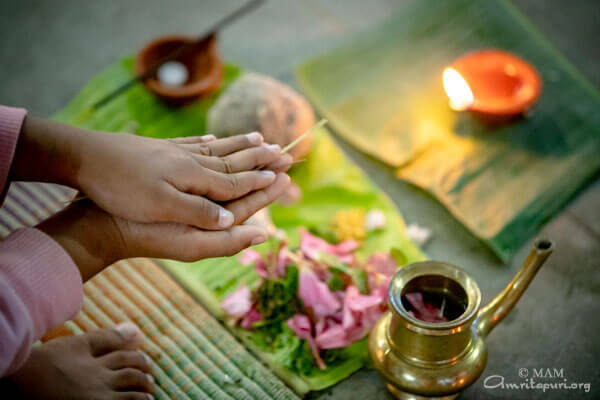 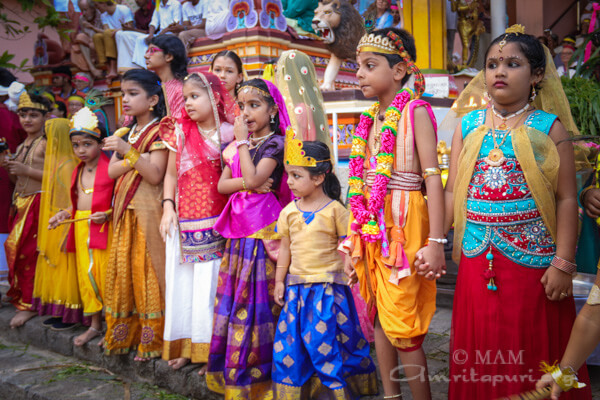 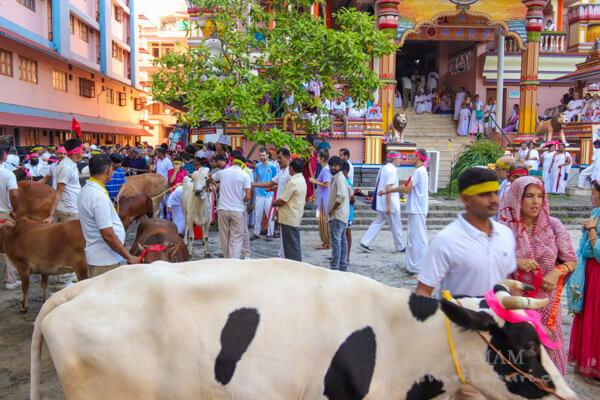 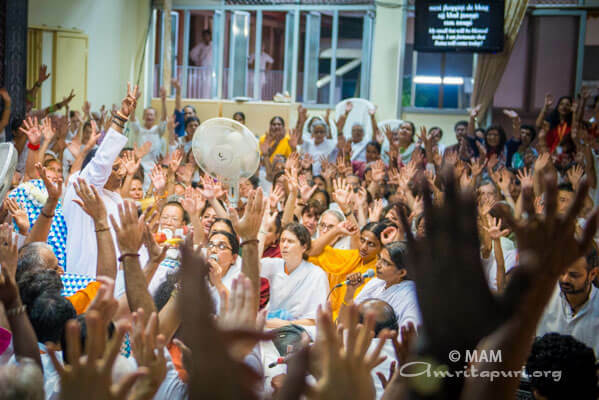 That night, when the day’s darshan was complete, another set of children, this time from North India, lined Amma’s path, dressed in their own traditional attire and each holding a diya in their hands. 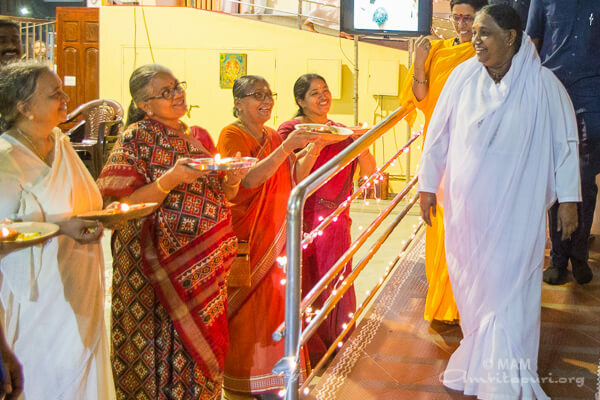 Near Amma’s residence, the soldiers stationed at the ashram also got to celebrate Diwali with Amma. 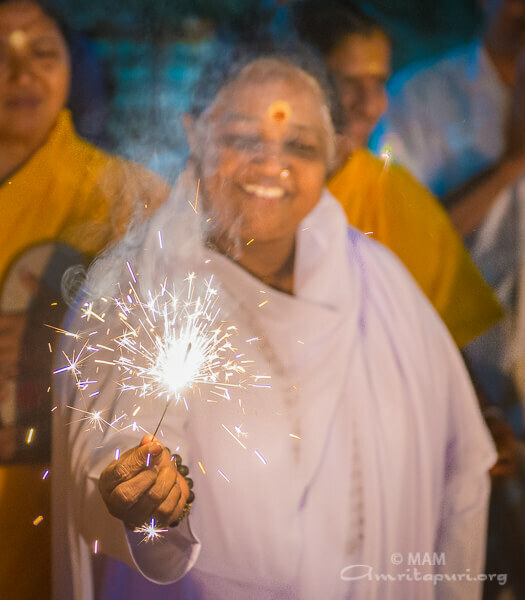 Amma lit the lamp with them and then and sparklers, taking her sparkler and drawing playful patterns in the air, cheering Mata Rani Ki Jai and Bharat Mata Ki Jai! 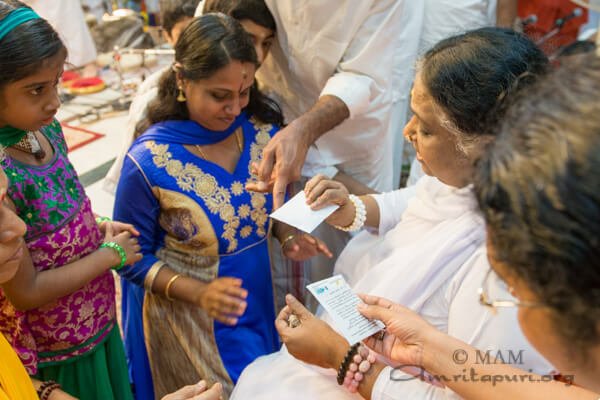 Before returning to her room, Amma distributed sweets to the soldiers. 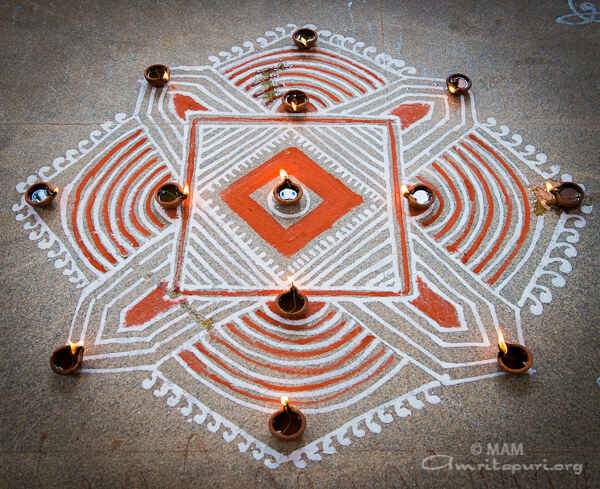 There were rangolis in front of Amma’s room. 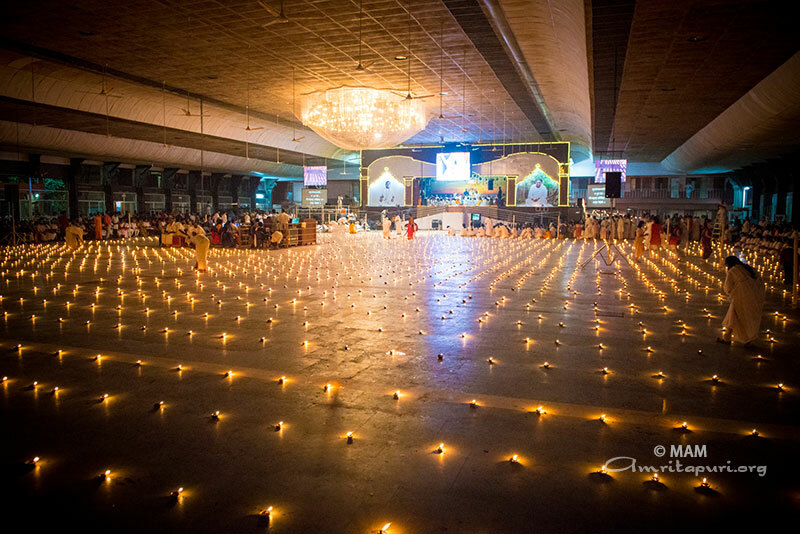 Small and beautiful diyas decorated Amma’s steps. 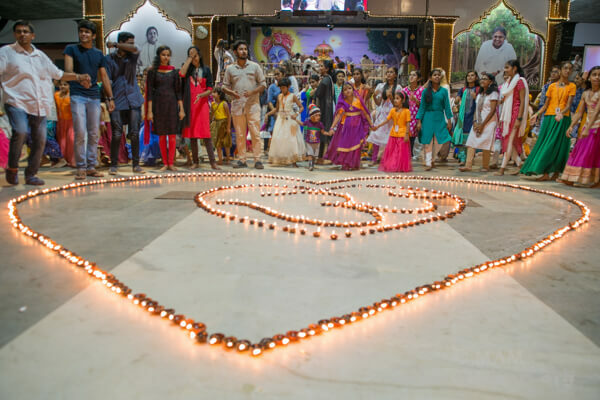 The next day, Diwali was celebrated in grand style. 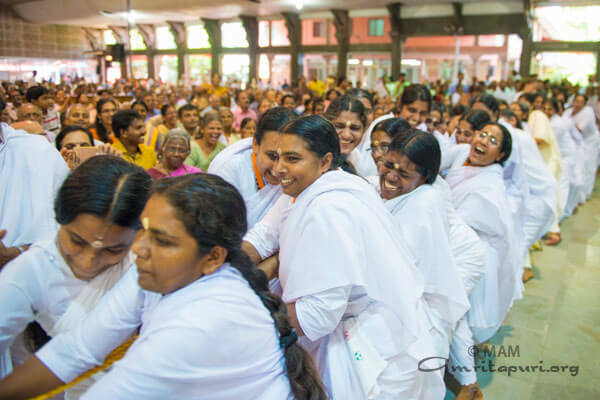 The staff of Amrita University and devotees stood in line to receive Amma onto the stage when Amma came for morning darshan. 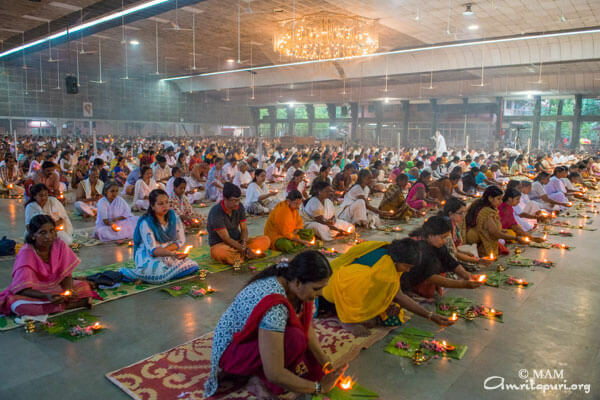 In the evening, at the end, while Amma was still giving darshan, the hall was cleared and filled with beautiful oil lamps. 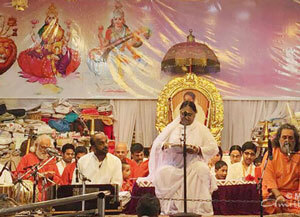 Brahmacharis chanted Sri Sukta and Vedic mantras. 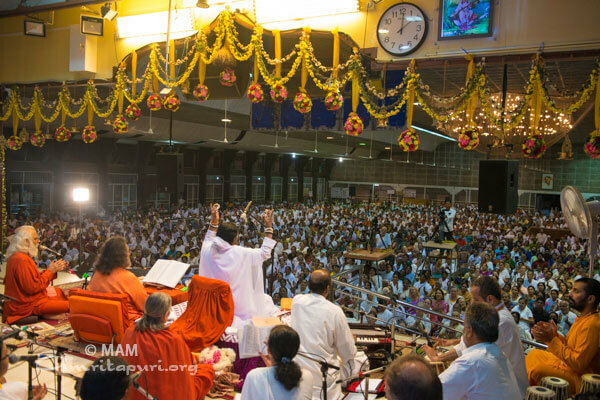 Amma sang two bhajans of Sri Rama, as Diwali is also the remembrance of the return of Sri Ram to Ayodhya after 14 years, gaining victory over the demon Ravana. 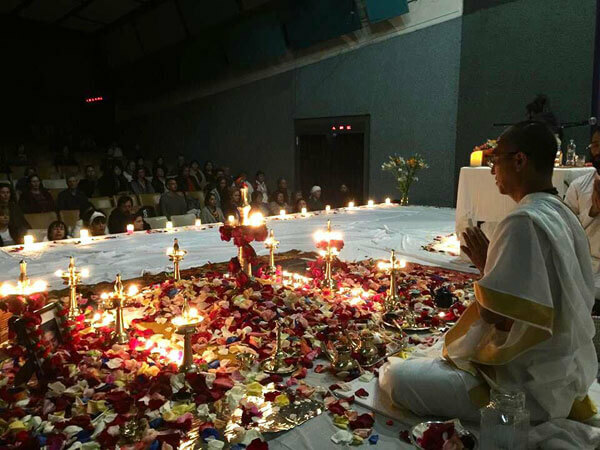 “Deepavali (Diwali) is a celebration, a reminder – reminding us, by lighting the lamp of goodness to remove the darkness of wickedness within. 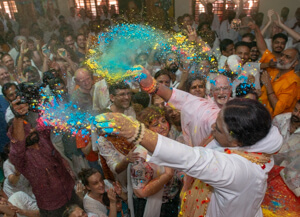 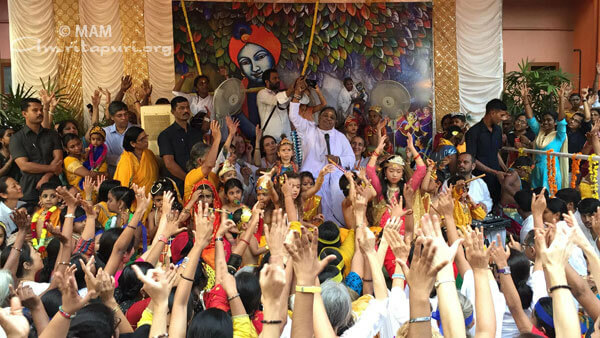 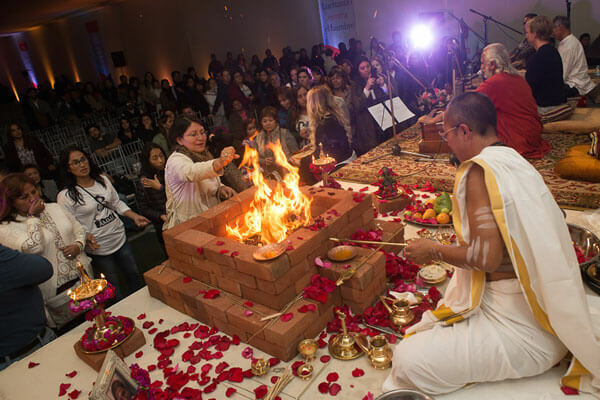 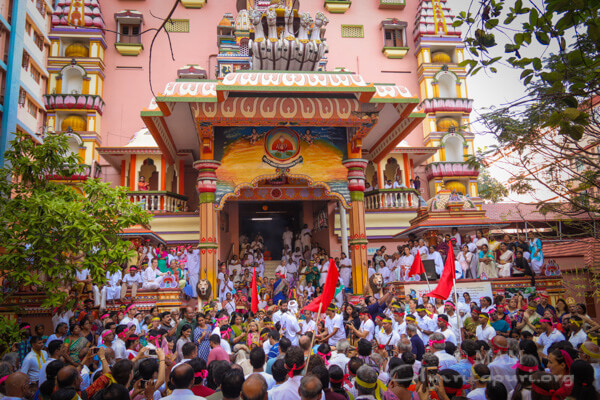 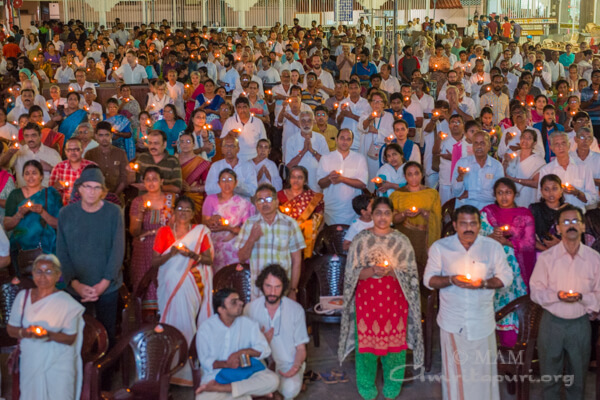 Like the people of Ayodhya welcomed Sri Rama, Diwali is a reminder to invoke the divine within our heart,” Amma reflected, imbuing the two days of celebrations with deep meaning and inspiration for all who participated, and for Amma’s children all over the world, whose hearts were there in spirit. 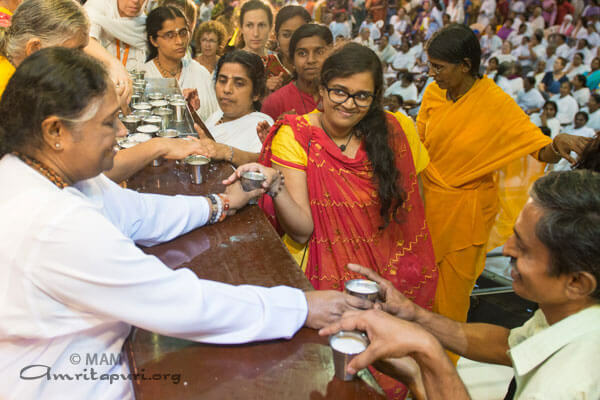 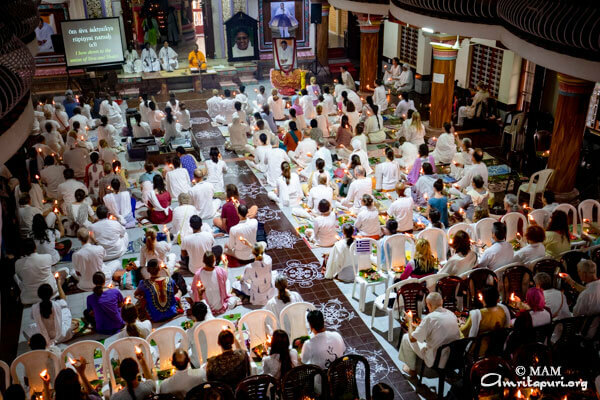 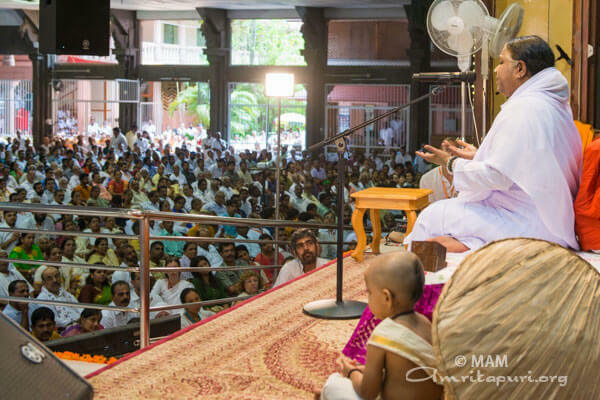 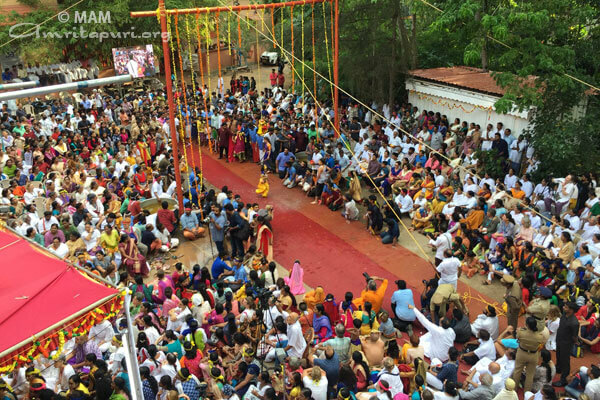 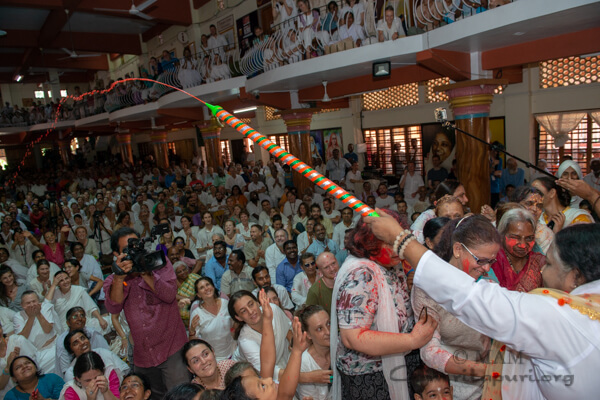 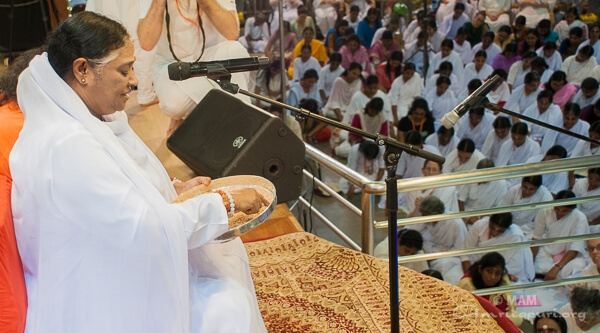 This is the first time in the last two decades that Amma was in Amritapuri for the Deepavali celebrations. 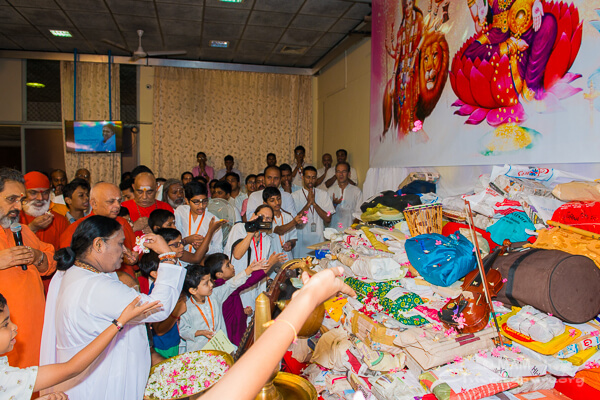 The first day of the Navaratri festival (Nine nights worshiping of Durga) this year was on September 21st. 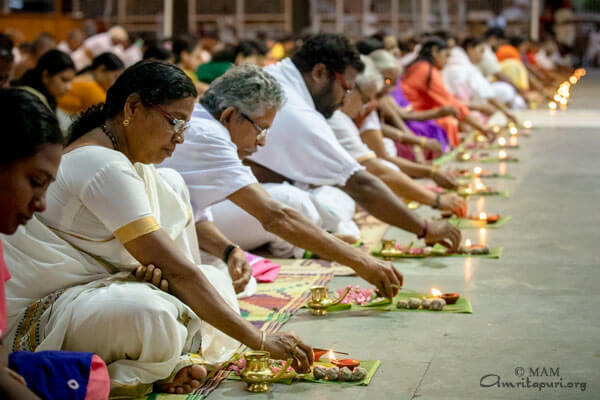 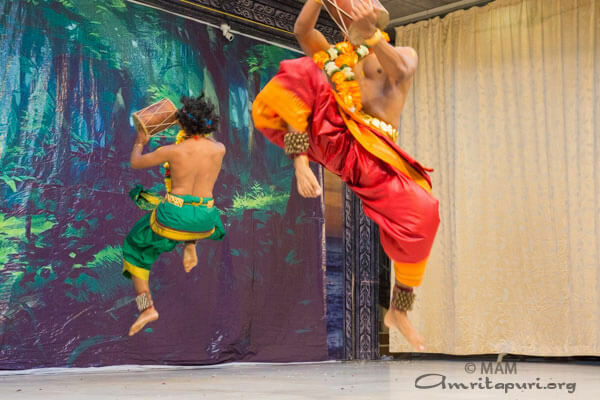 On that day, both at Amritapuri’s Kali Temple and the Kalari, beautiful and colorful ‘Golu’ dolls were being displayed with lights. 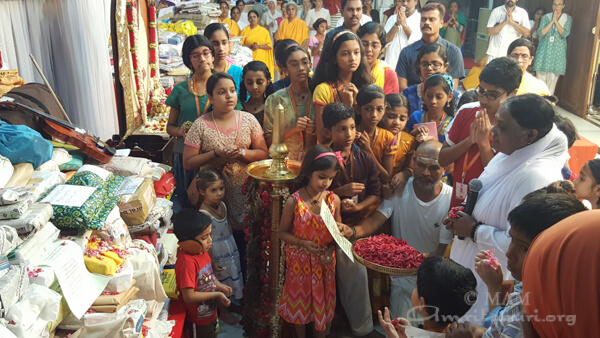 Special homas and pujas were also conducted in the morning and evening in both locations by Brahmacharinis of the Ashram. 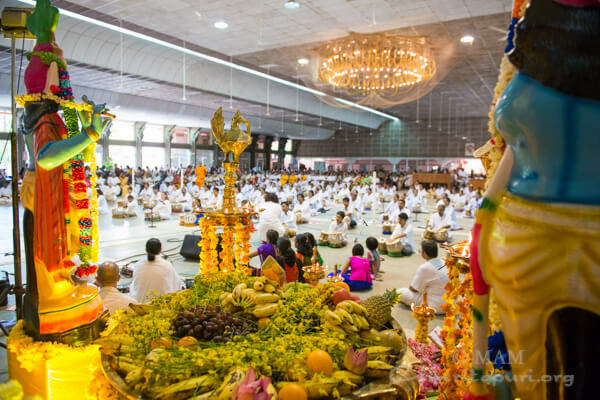 For each of the following 9 days and nights, pujas and prayers were conducted. 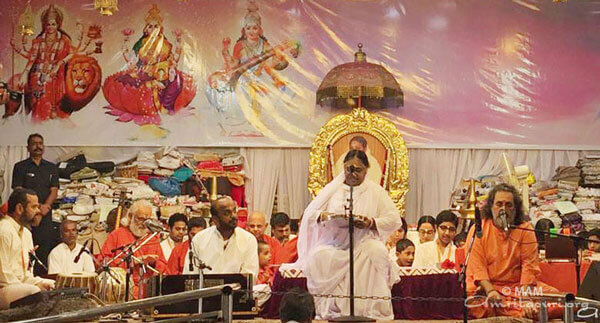 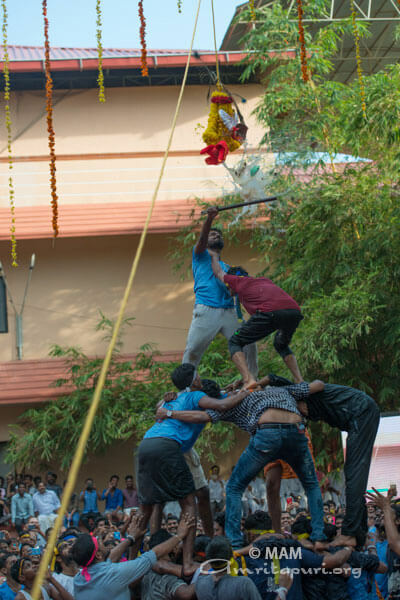 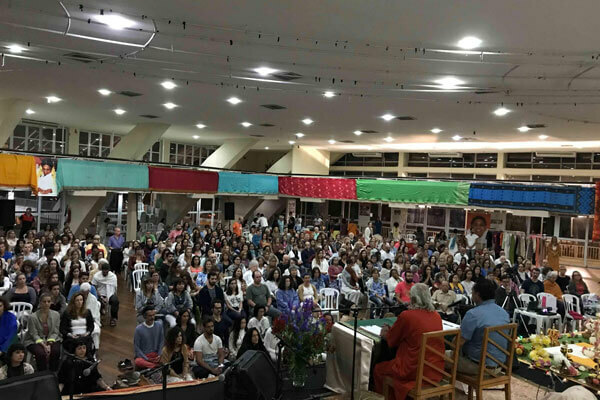 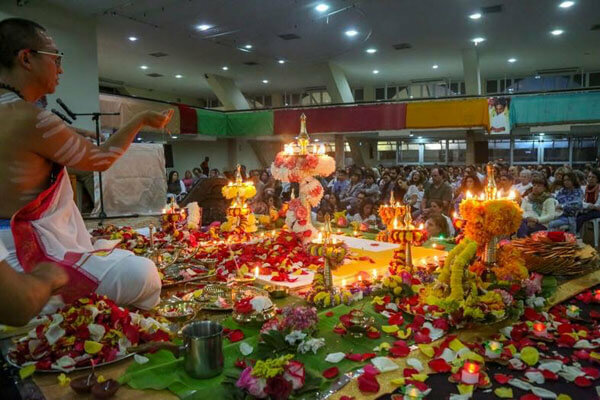 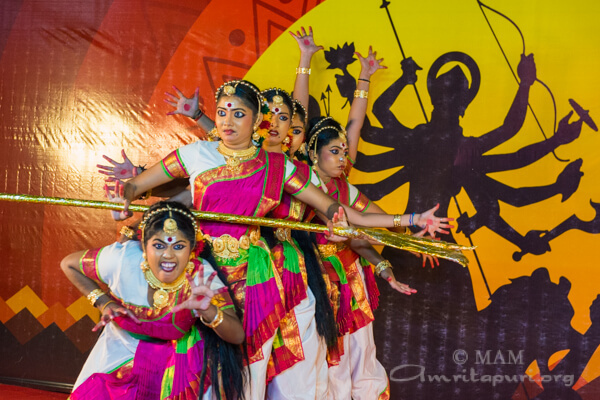 On the 27th evening, special Navaratri performances were offered by Amrita University students in the main hall in front of Amma, as she was giving darshan. 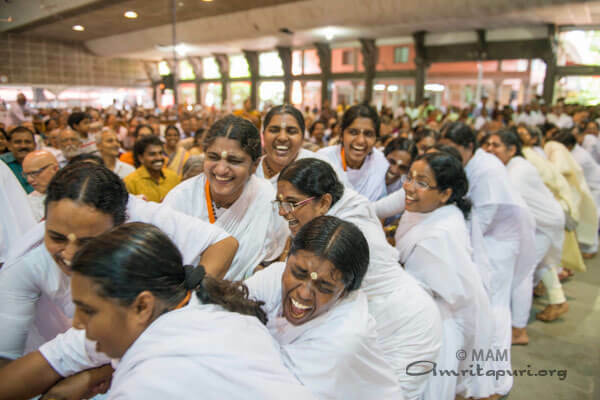 AYUDH Amritapuri decided to celebrate Sep 27th as Universal Motherhood day. 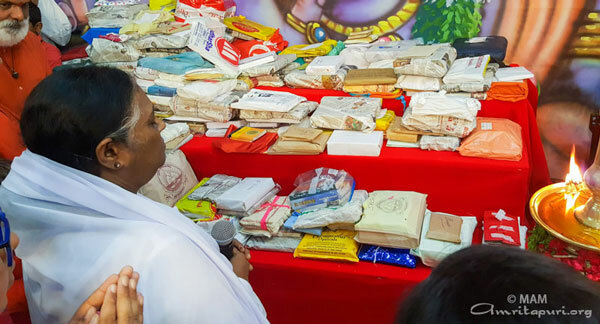 On the 28th, at 5pm, as Amma was giving darshan in the main hall, she called for everyone to bring their study books and instruments to keep it next to the altar on the stage to receive Saraswati’s blessings over the next 3 days. 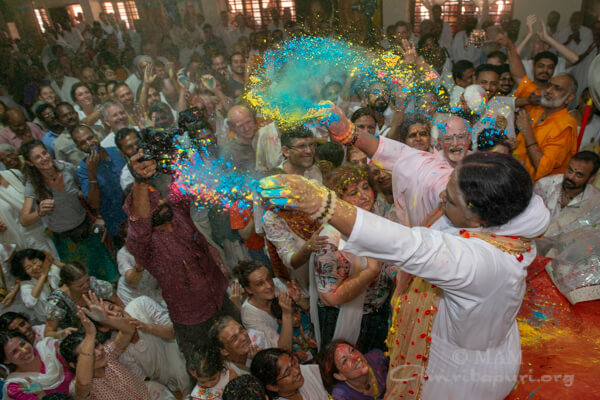 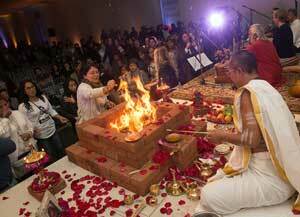 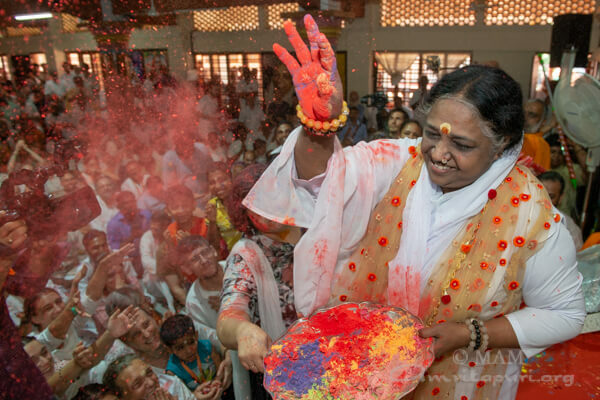 Amma then sang a bhajan and conducted a brief ceremony with mantras while everyone offered flower petals. 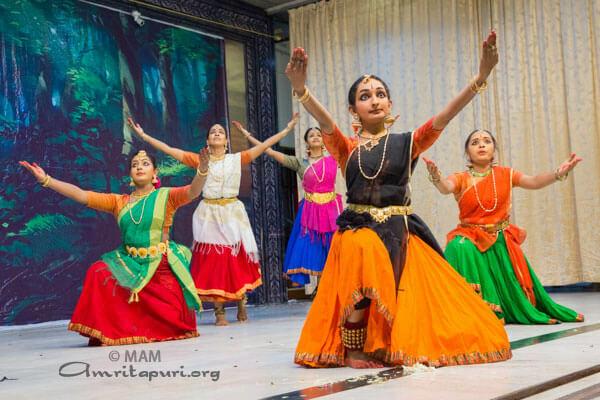 The 10th day of Navaratri is the Vijaya Dasami day. 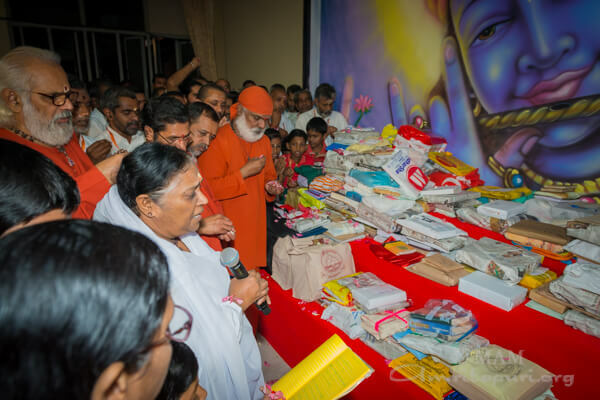 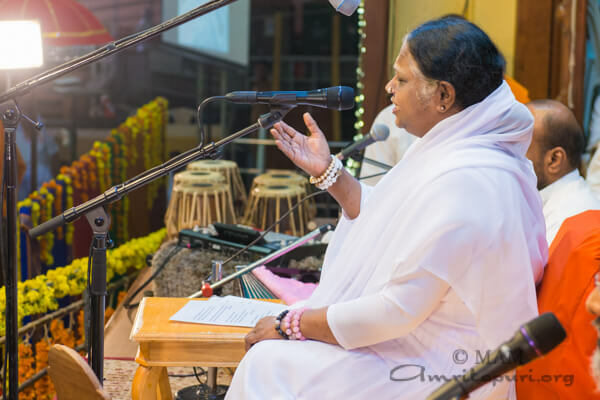 For the occasion, Amma led prayers and chanting to bless the books and musical instruments that had been placed near the altar by the devotees to invoke Saraswati’s blessings. 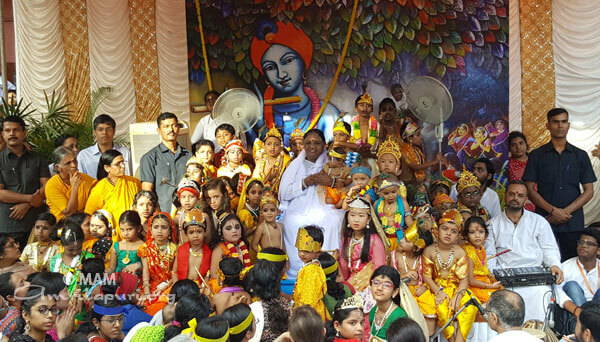 Speaking on the occasion, Amma asked everyone to maintain a childlike attitude, as essential for a successful life. 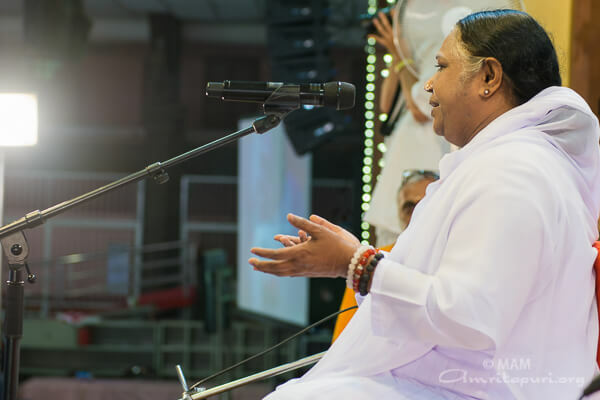 Then she guided all in Aksharabhyasa – initiation into the world of alphabets with the mantra “Om Hari Sri Ganapataye Namah”. 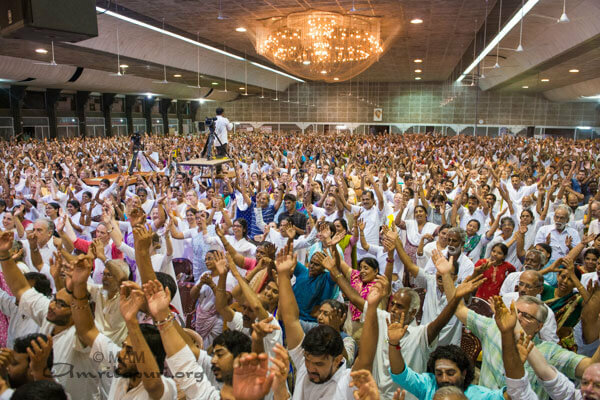 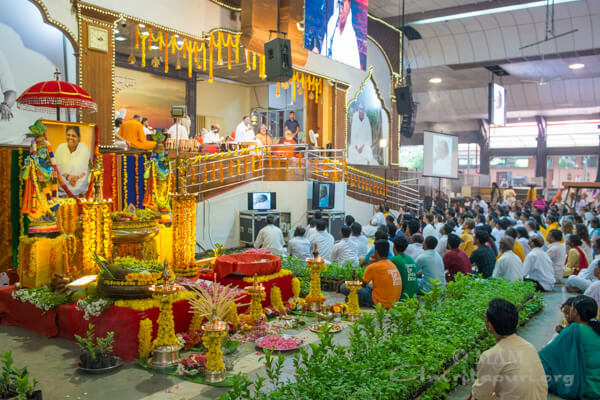 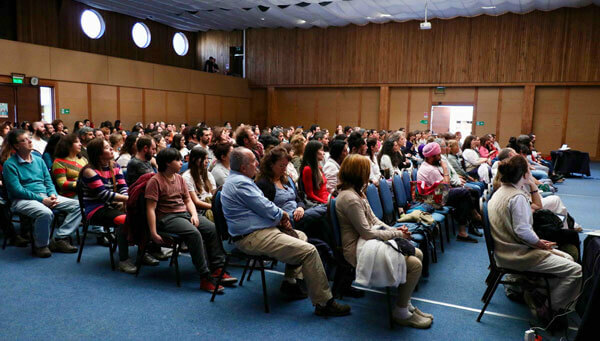 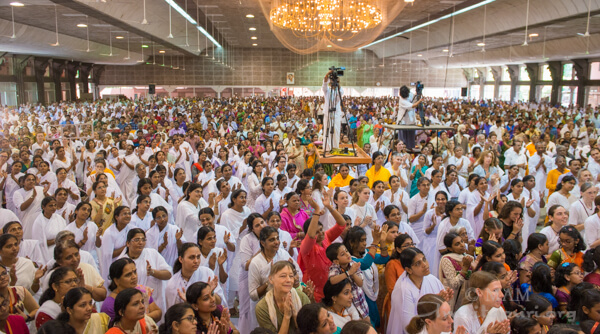 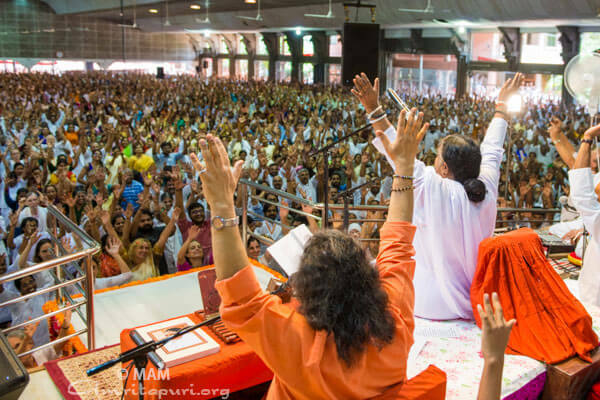 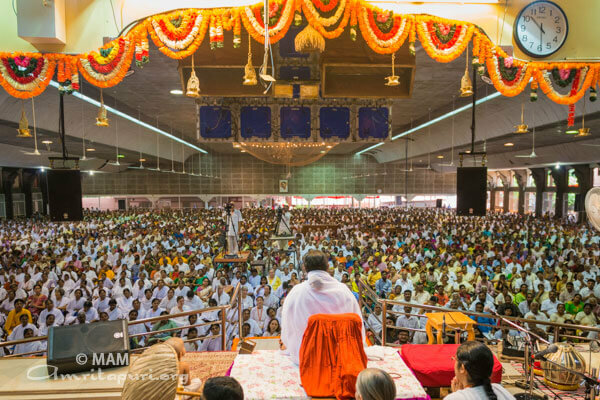 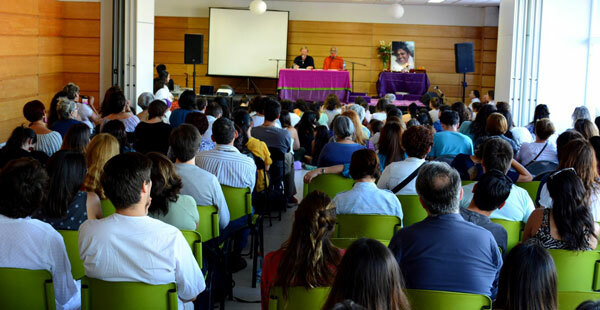 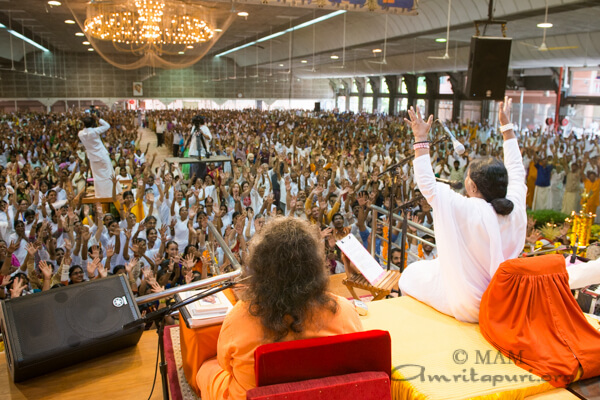 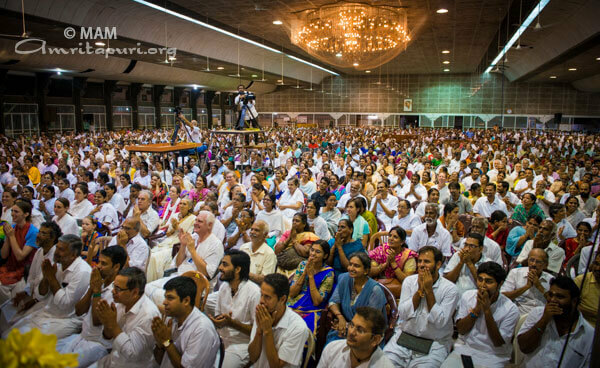 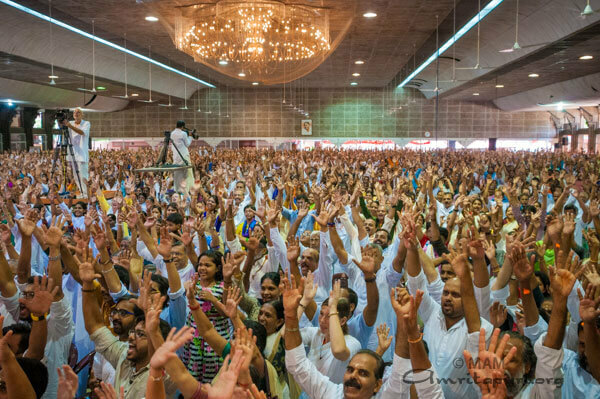 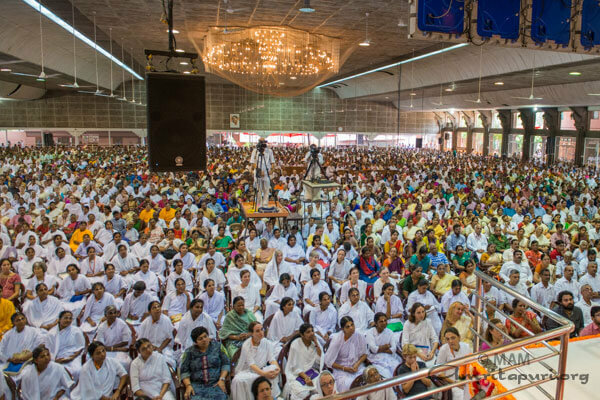 Thousands had gathered to celebrate the blessed day in Amma’s presence, filling the main hall. 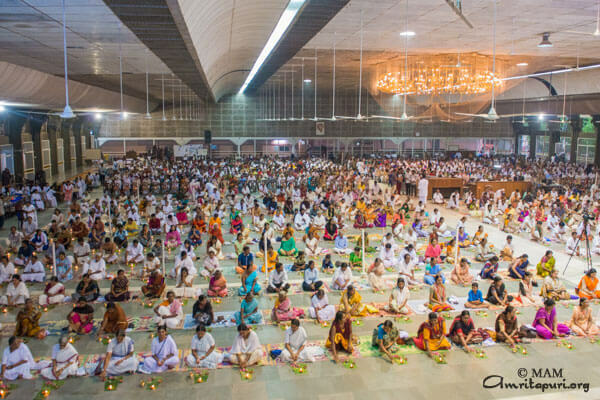 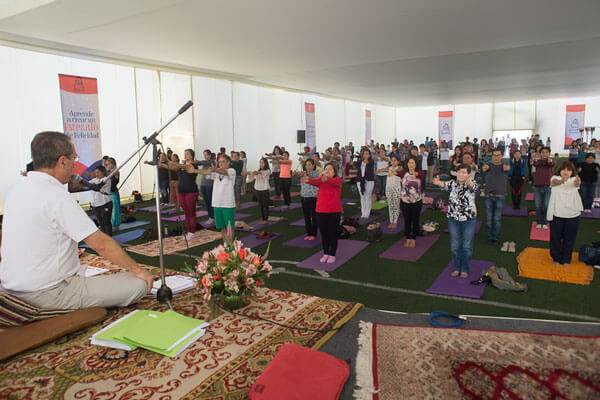 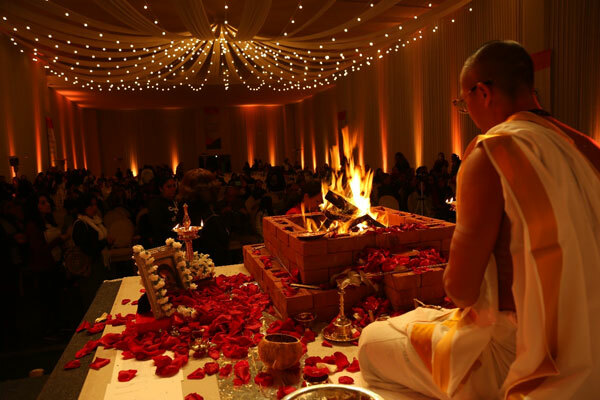 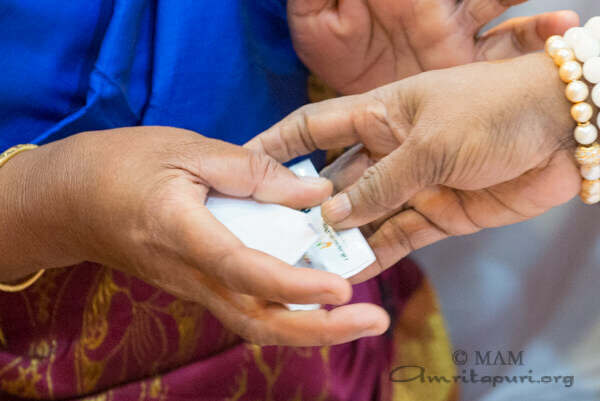 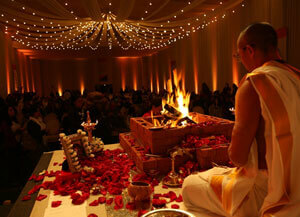 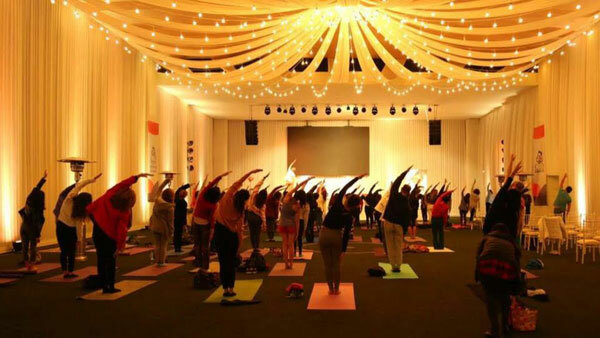 Each one traced the mantra, signifying the beginning of a new phase in their life. 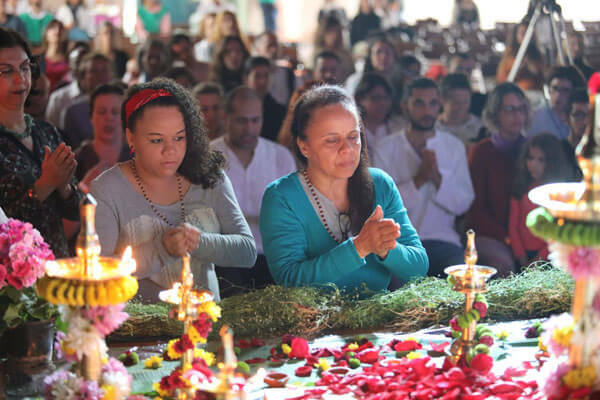 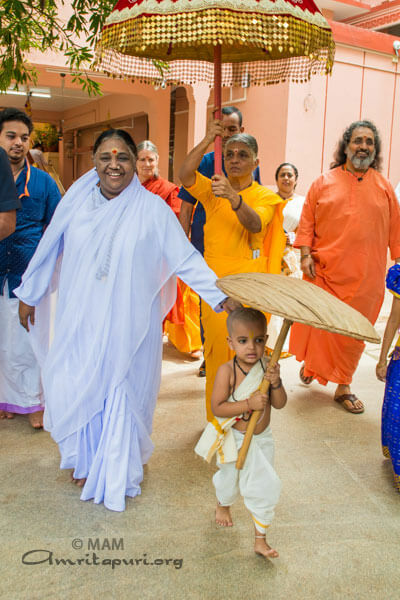 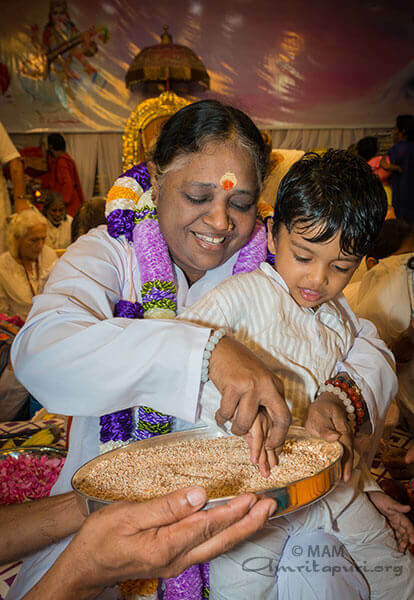 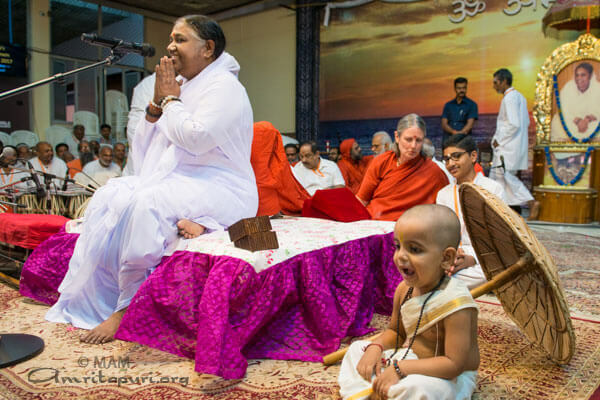 After the mass initiation, Amma took personally initiated many small children – each about three years of age — taking them one by one onto her lap and tracing the mantra with them. 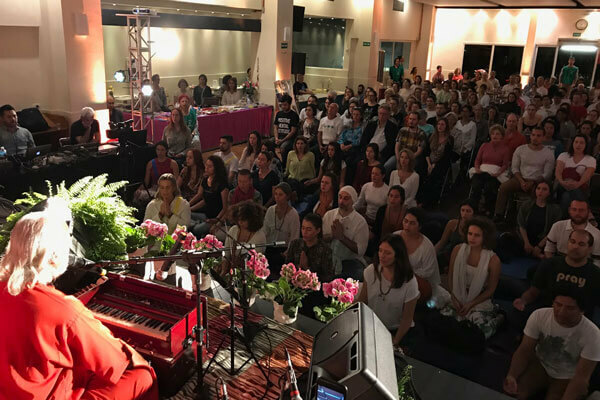 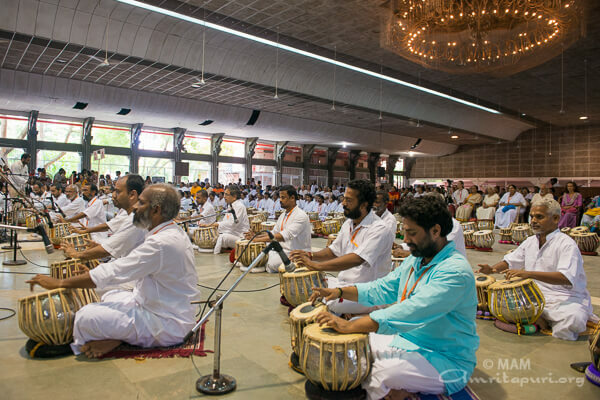 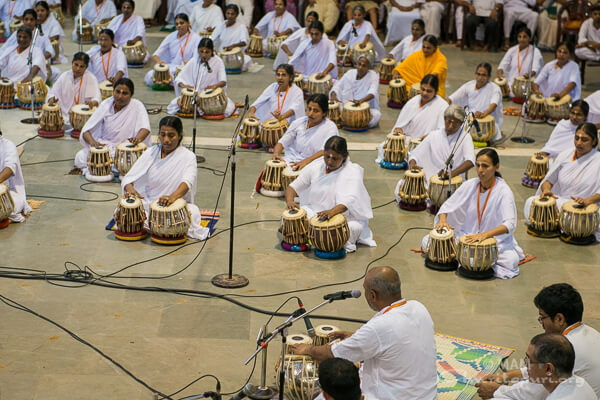 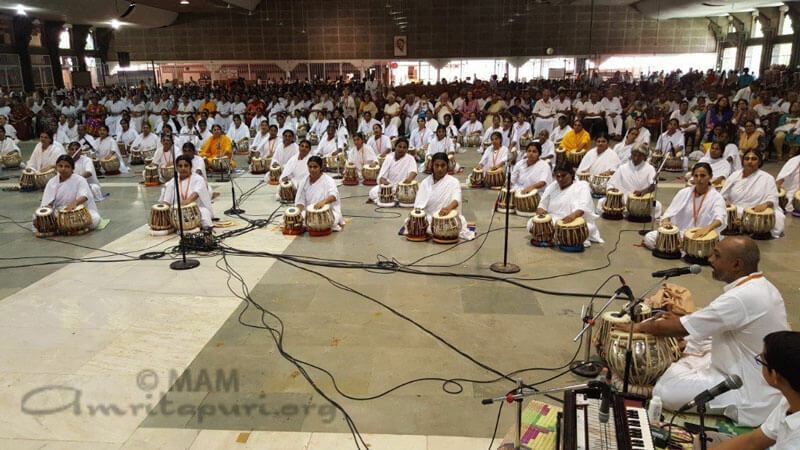 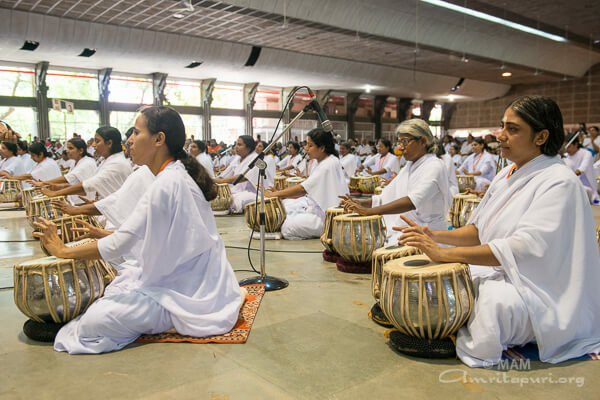 Later in the day, after having taken their first tabla lesson, 80 of Amma’s brahmacharinis and 20 brahmacharis offered her a group musical tabla performance, as she was giving darshan. 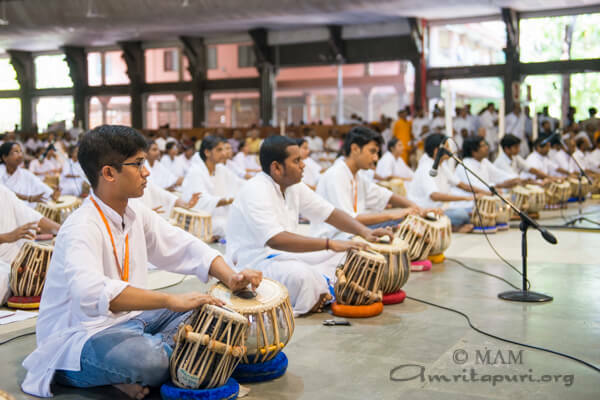 The senior students also presented a Nadapuja with tabla to the divine. 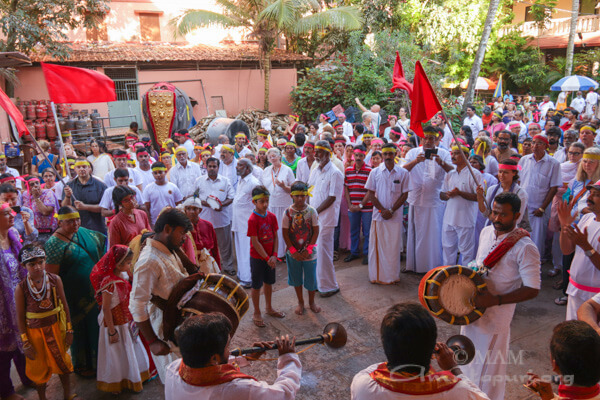 Throughout the day, one could see people practicing or starting new lessons in their regular study materials or music or art forms. 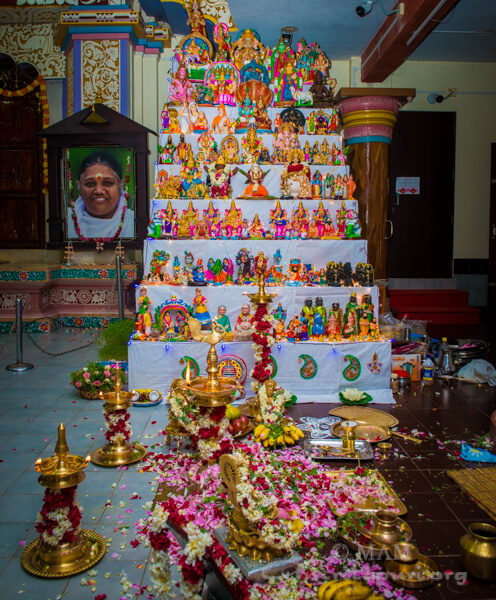 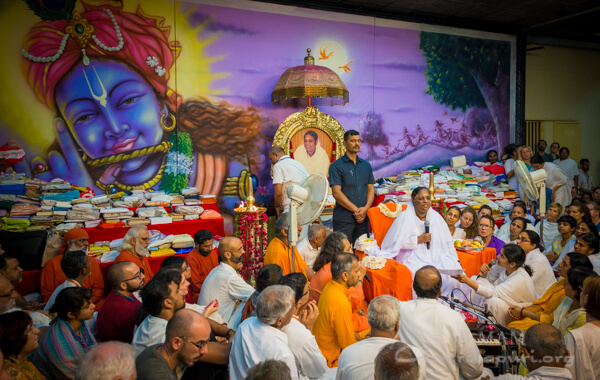 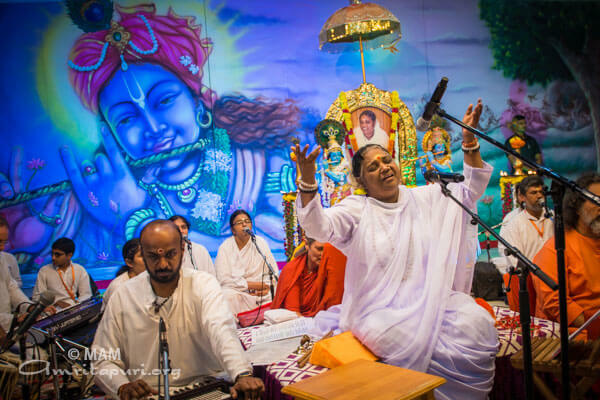 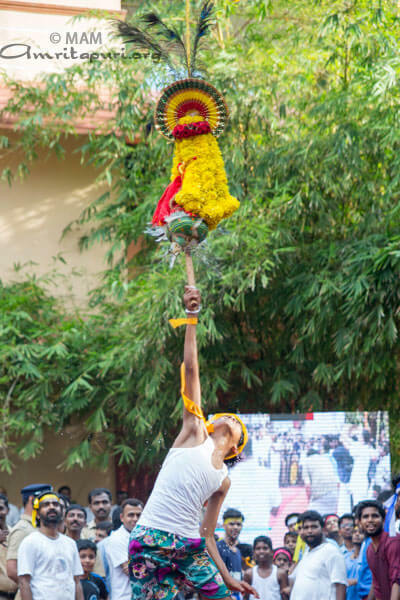 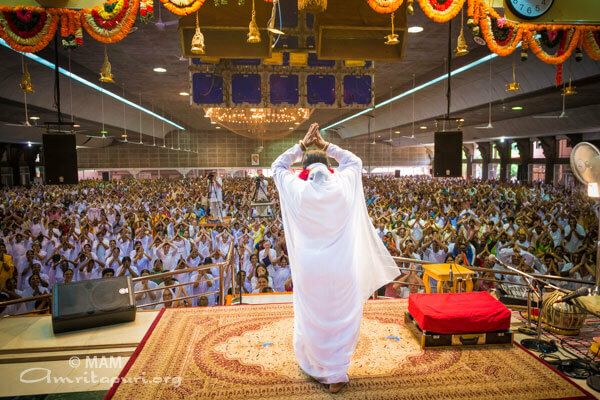 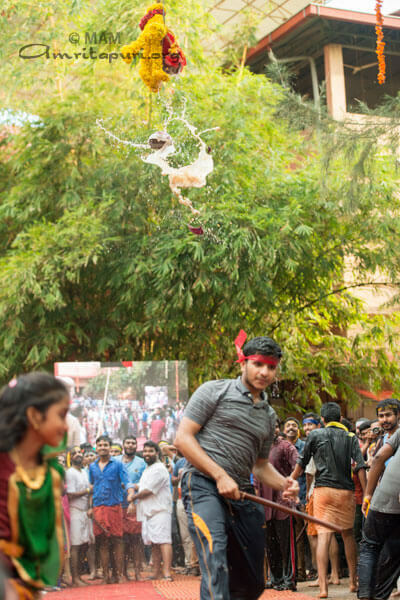 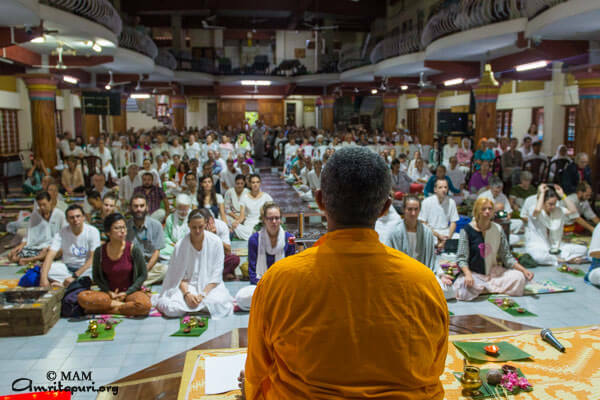 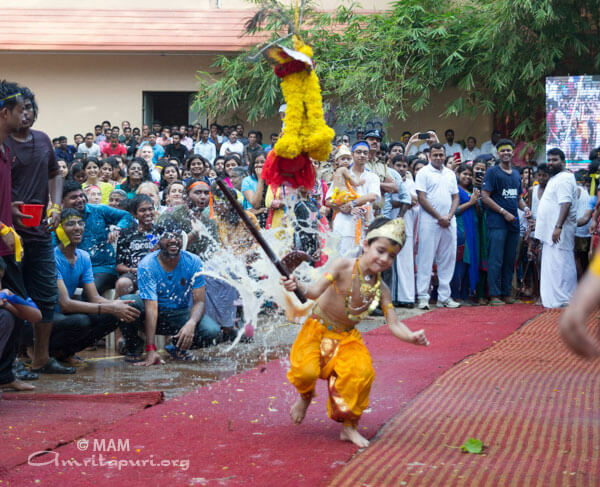 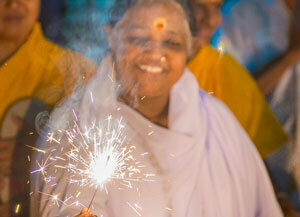 Amma’s teaching, and the principle of Vijayadasami – to always remain a beginner – permeated the very air. 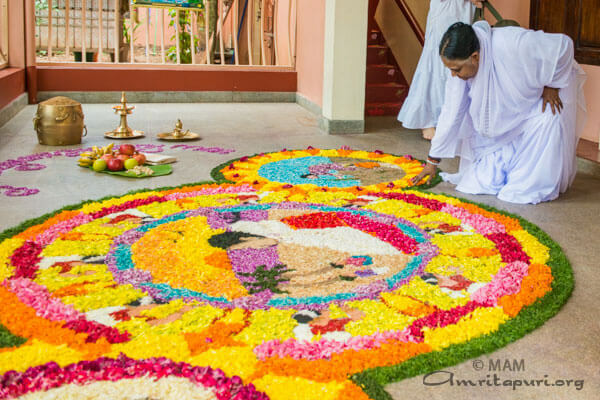 For the last ten days, as per the tradition of the Onam harvest festival, the entire state of Kerala has been ordained with lush, beautiful flower mandalas. 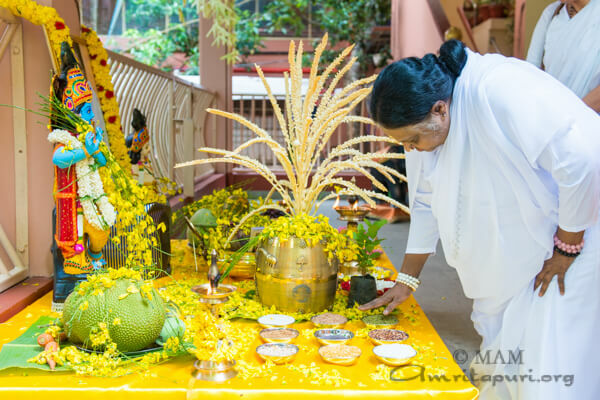 At Amritapuri, each day the floral decoration in front of Amma’s room was unique. 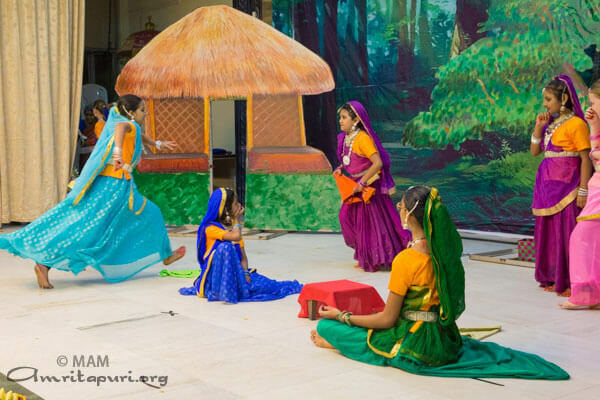 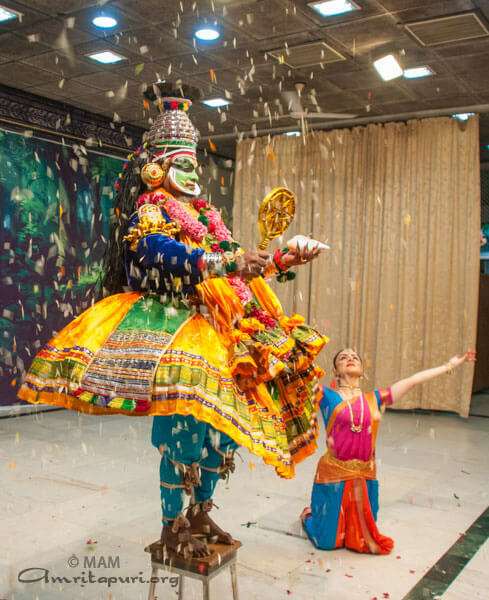 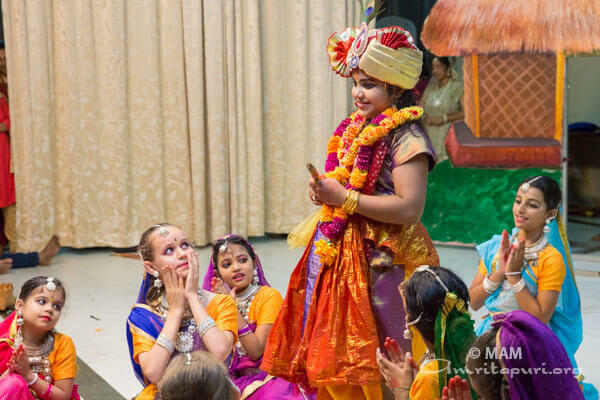 Each day, the beautiful arrangement depicted a different scene from the life of Sri Krishna. 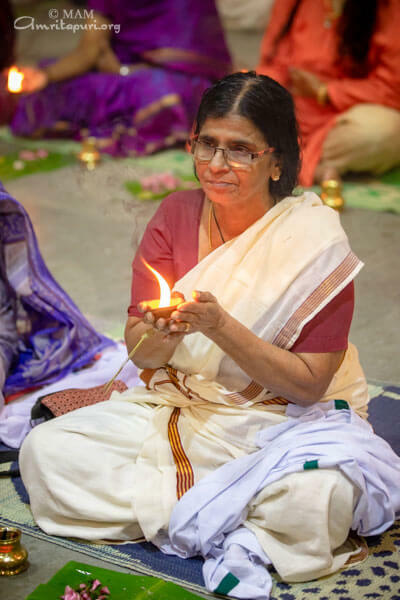 Each one seemed more beautiful than the last, and yet in truth, none could be said to be the most beautiful – each day, in that moment, that mandala was the most beautiful, and the love with which it had been arranged shone through and lent it that much more beauty and luster. 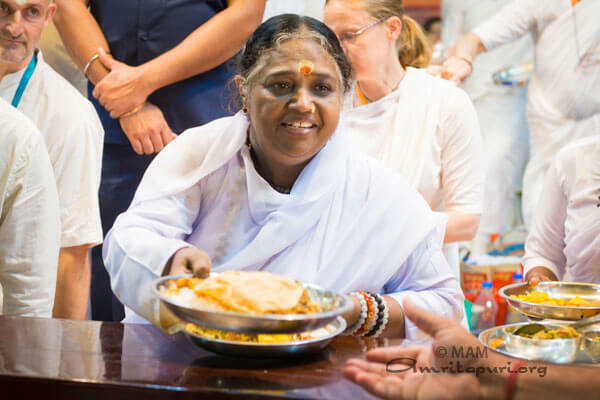 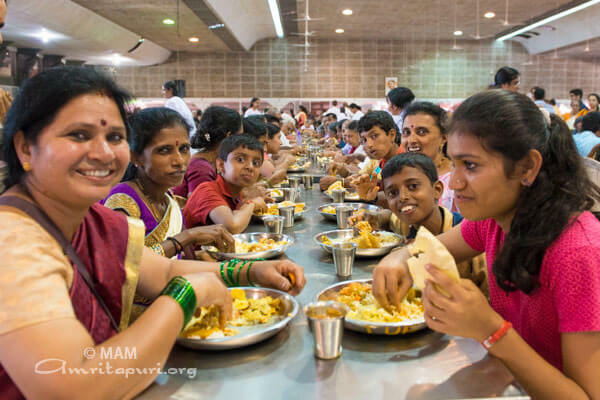 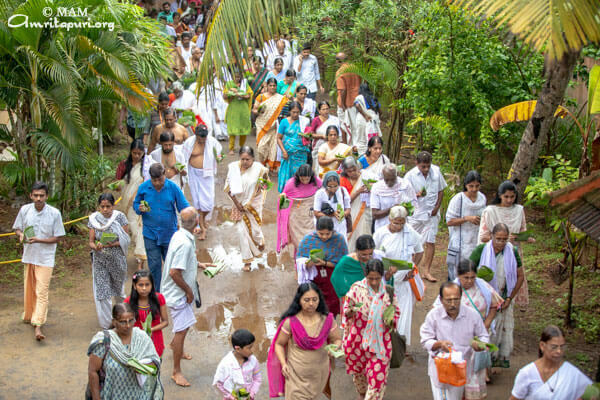 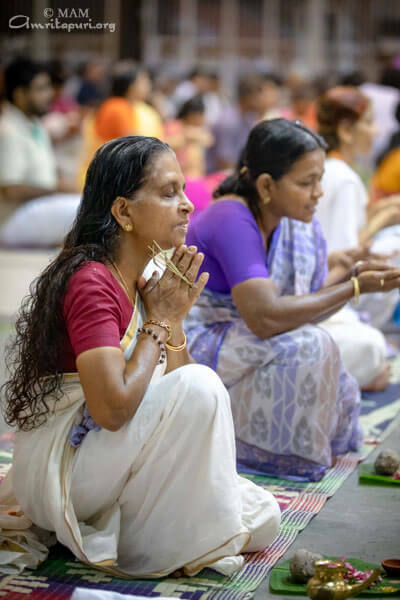 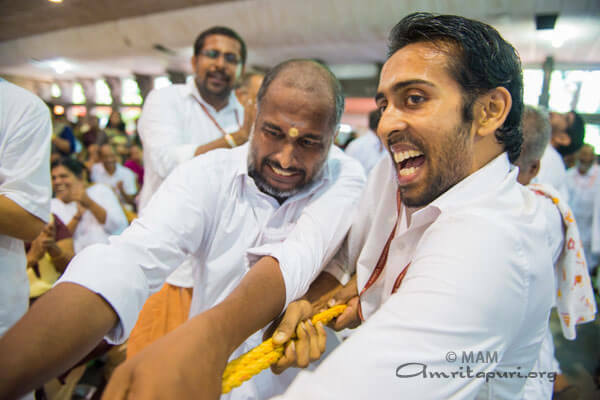 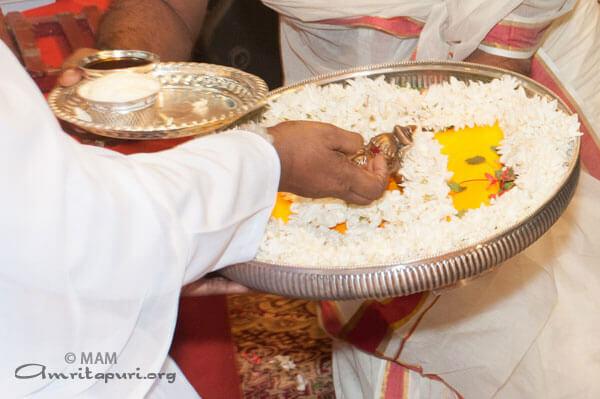 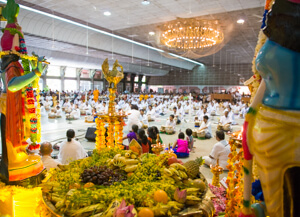 After giving a brief darshan for those who would not otherwise have a chance to receive her embrace, Amma began serving the traditional OnaSadya feast to one and all. 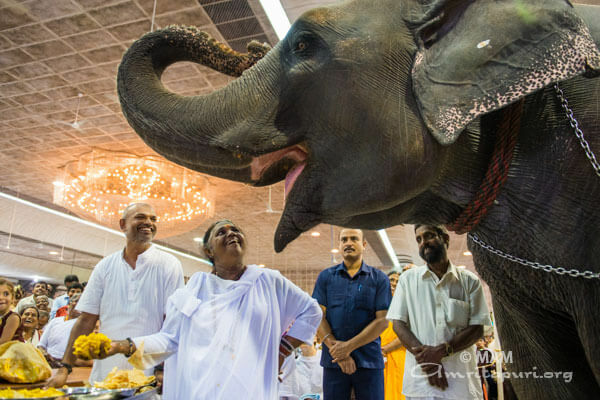 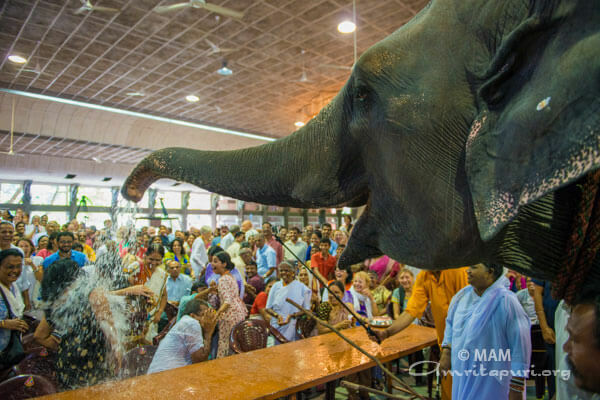 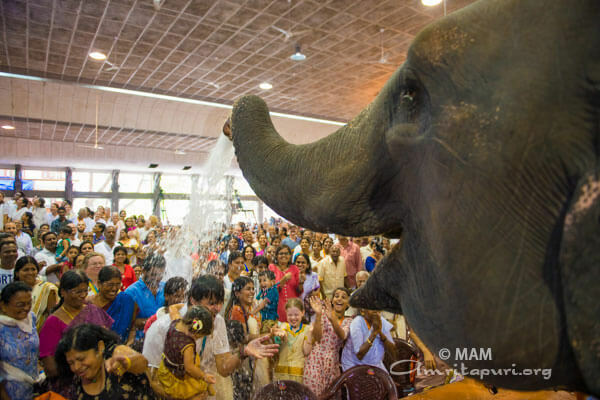 Finally, she fed Lakshmi, the ashram elephant. 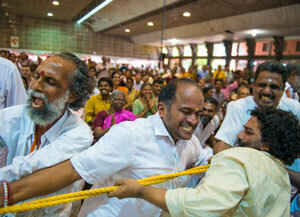 The ashramites played tug-of-war to the amusement of all. 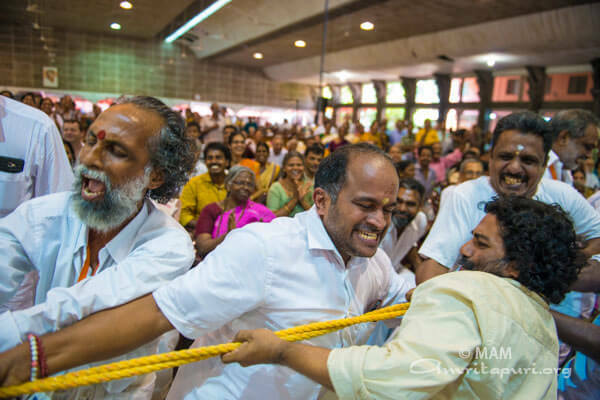 First with two groups of brahmacharis battling each other, then Amma called on the “Aachans” (elderly male devotees) to do the same and finally the brahmacharinis. 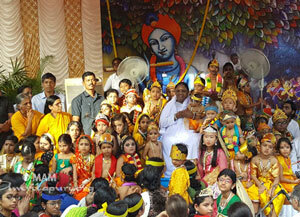 Amma enjoyed the show along with all those assembled. 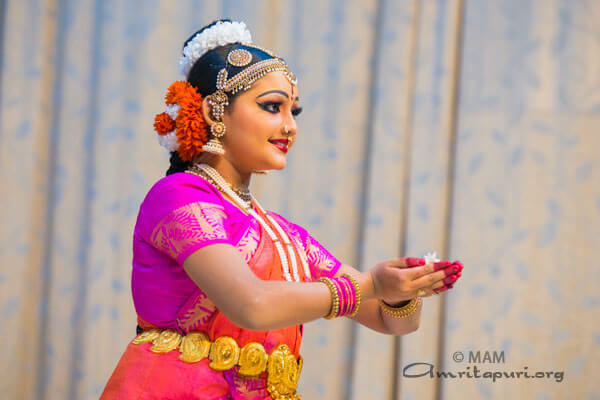 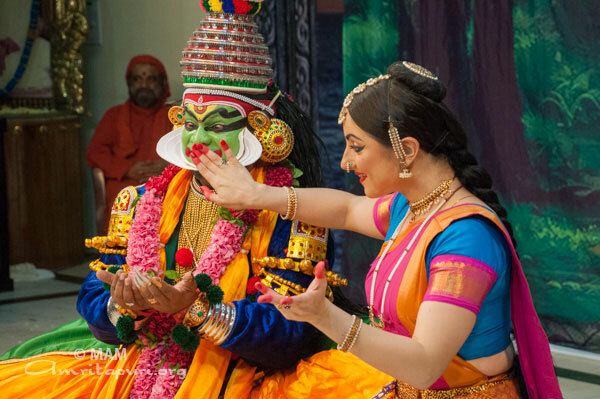 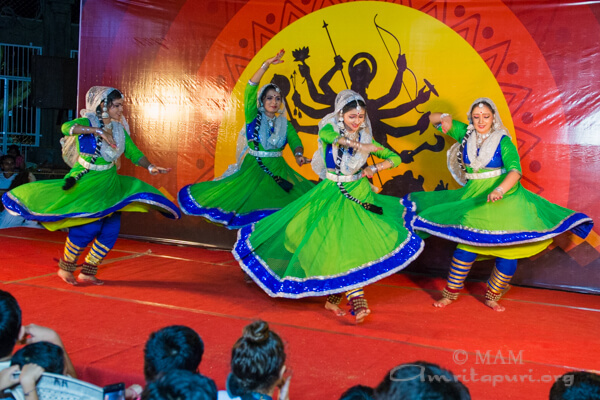 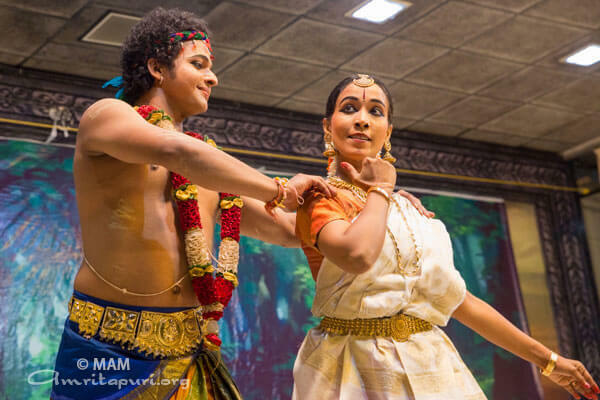 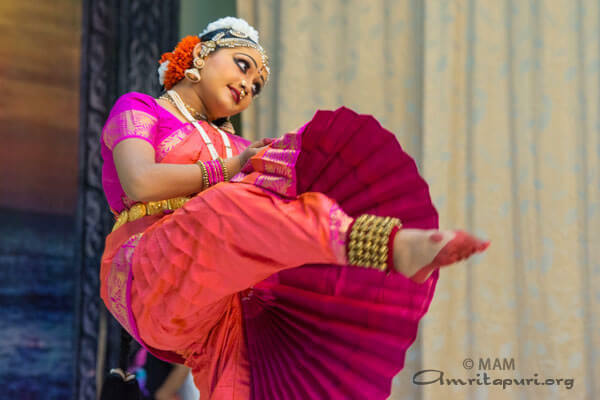 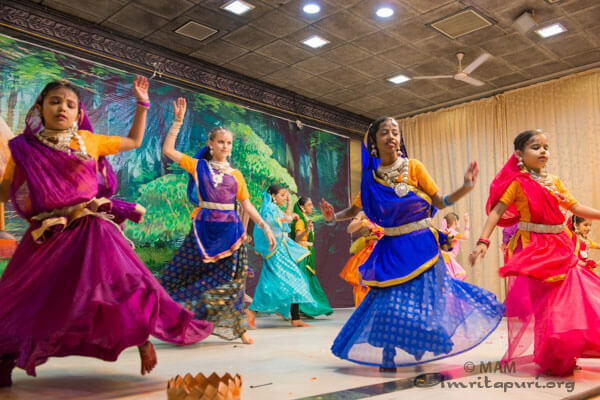 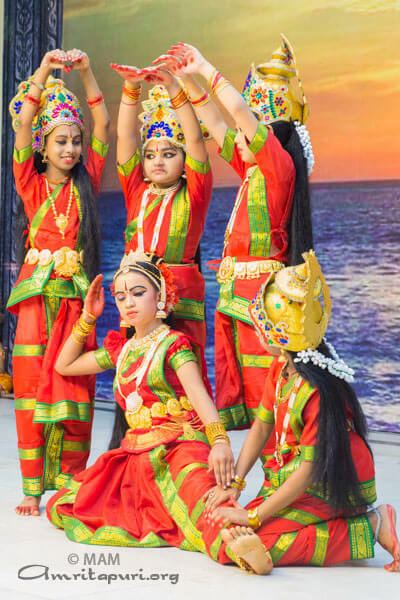 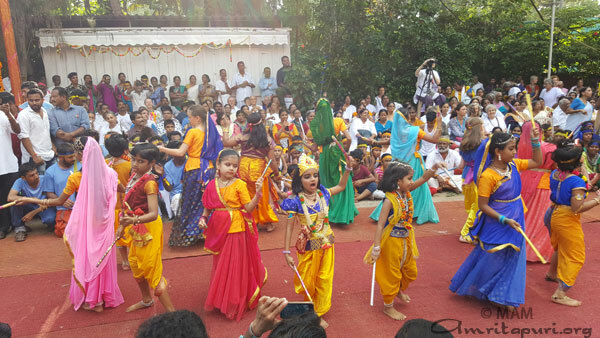 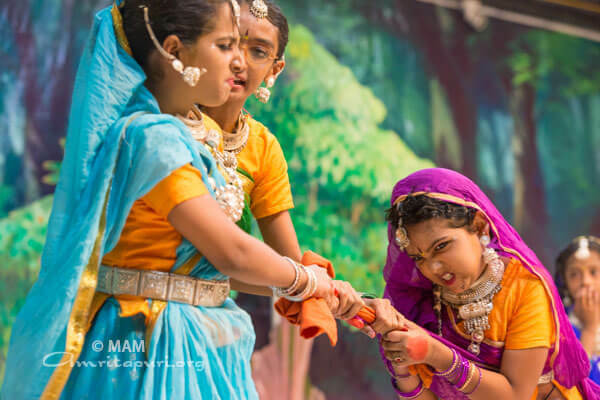 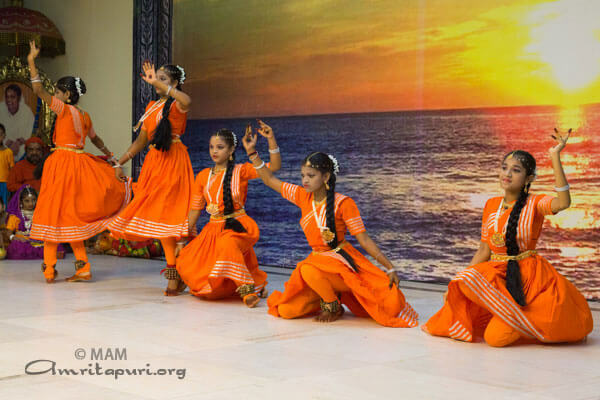 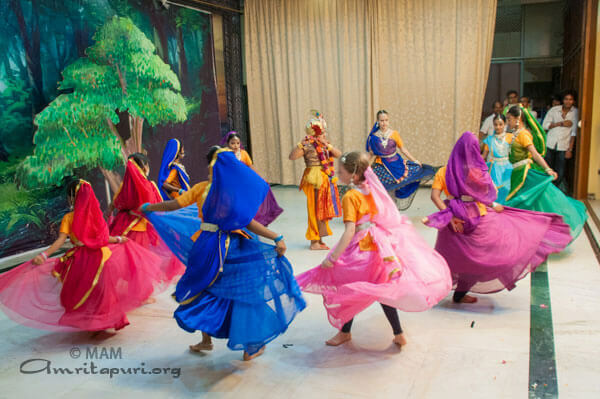 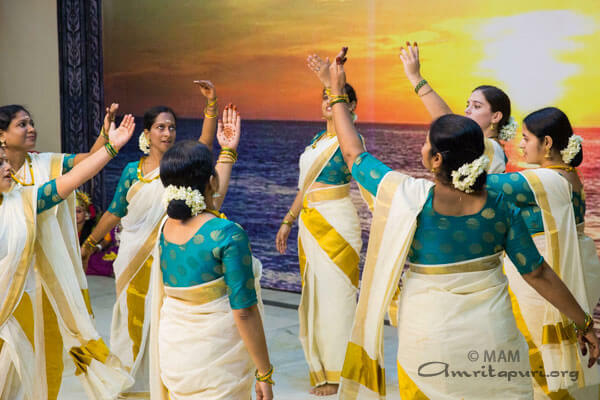 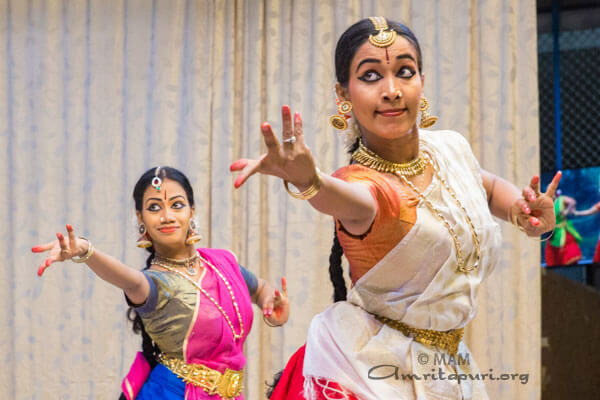 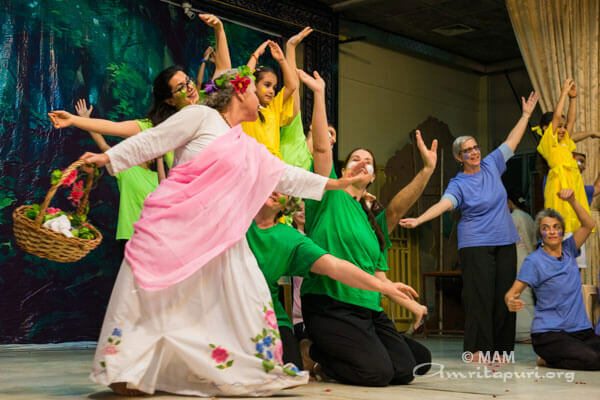 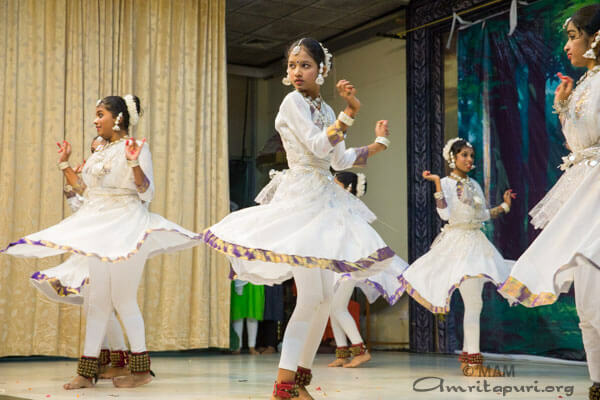 In the evening, Amma led bhajans which were followed by beautiful, entertaining and uplifting cultural programs, including many dances and skits, including riveting classical dance and a heartwarming play by the littlest residents of Amritapuri. 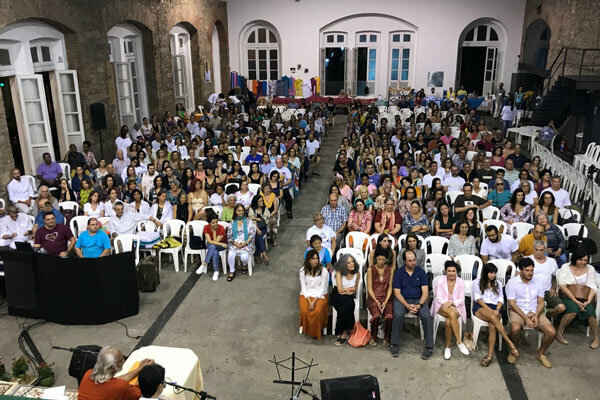 The program concluded only at 1:00 am that night. 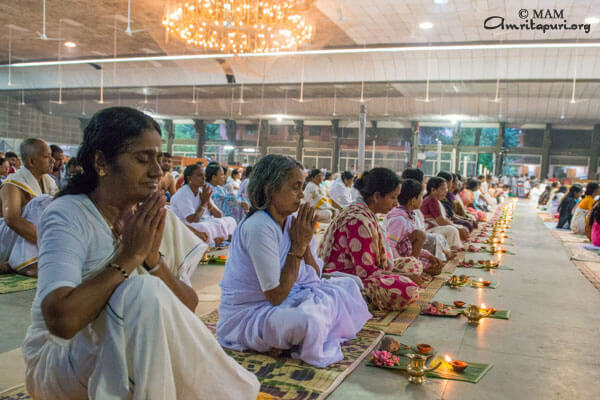 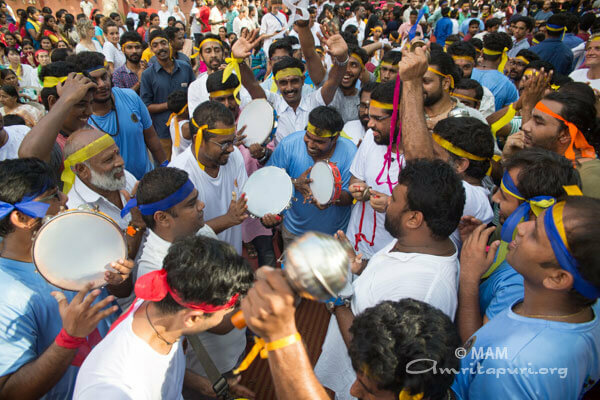 All went to bed with joy in their hearts, having been blessed to spend Onam with Amma and all their spiritual brothers and sisters in a celebration of unity and love.